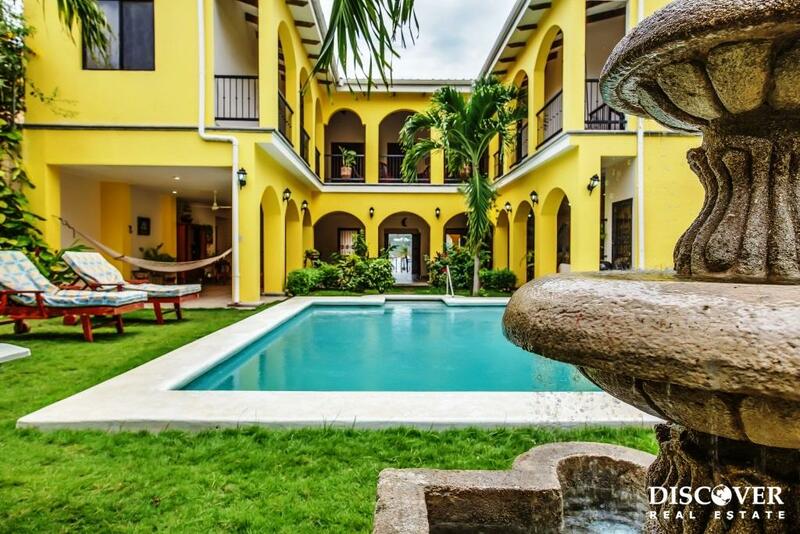 Las Palmas elegant colonial house in San Juan del Sur. 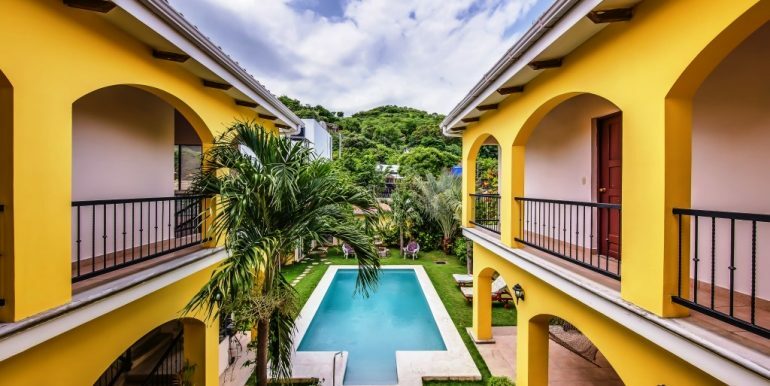 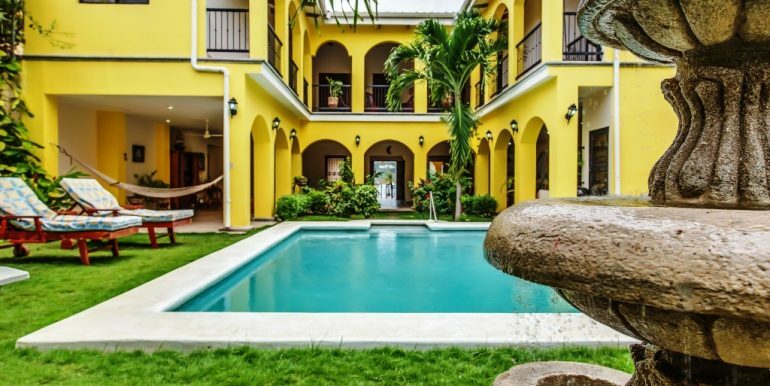 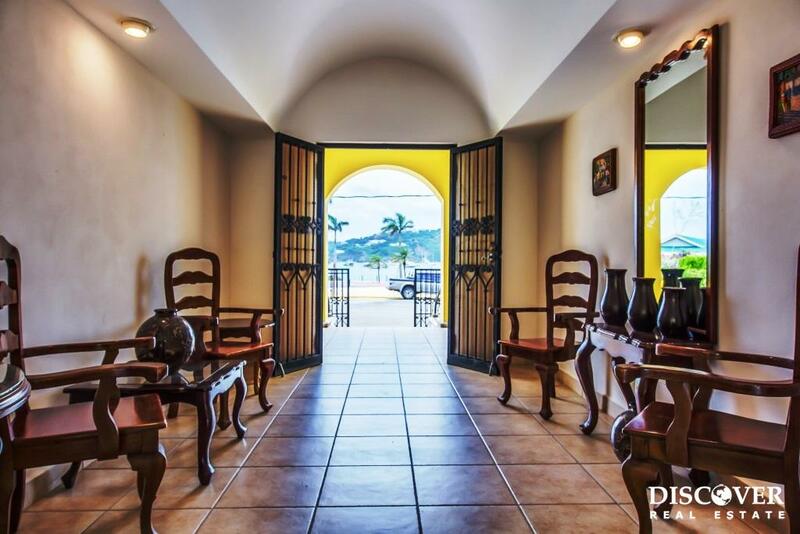 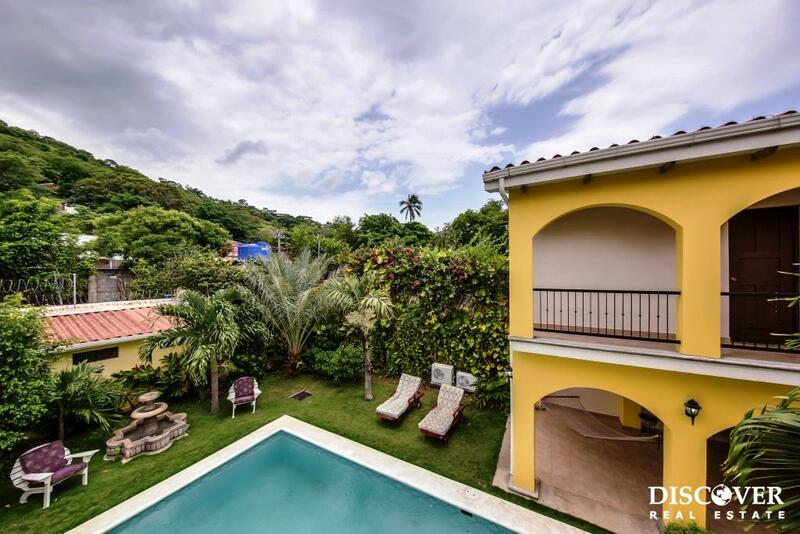 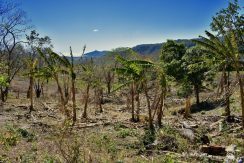 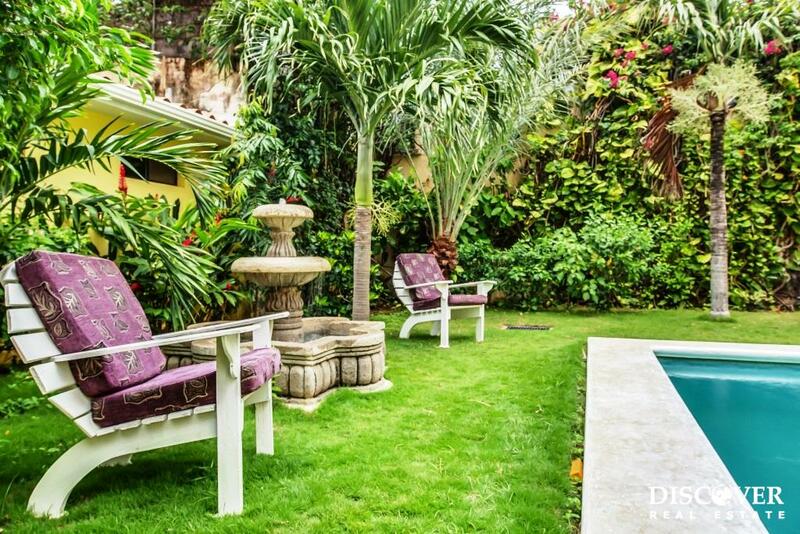 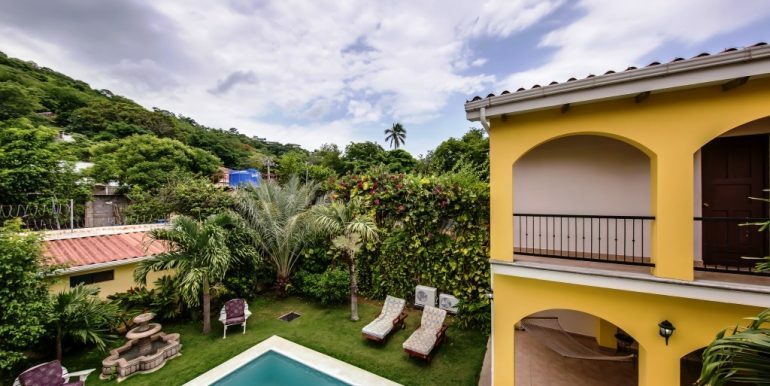 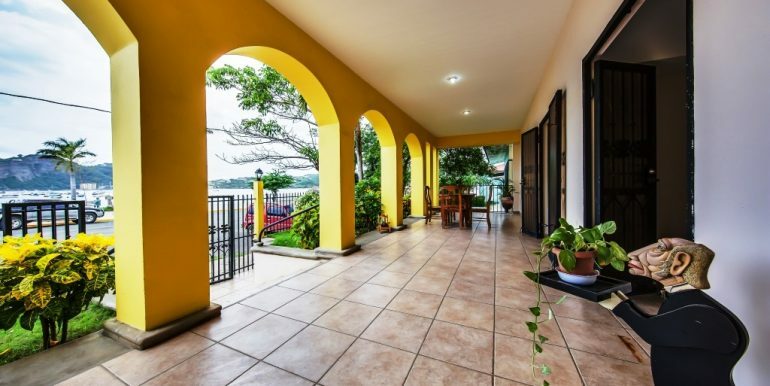 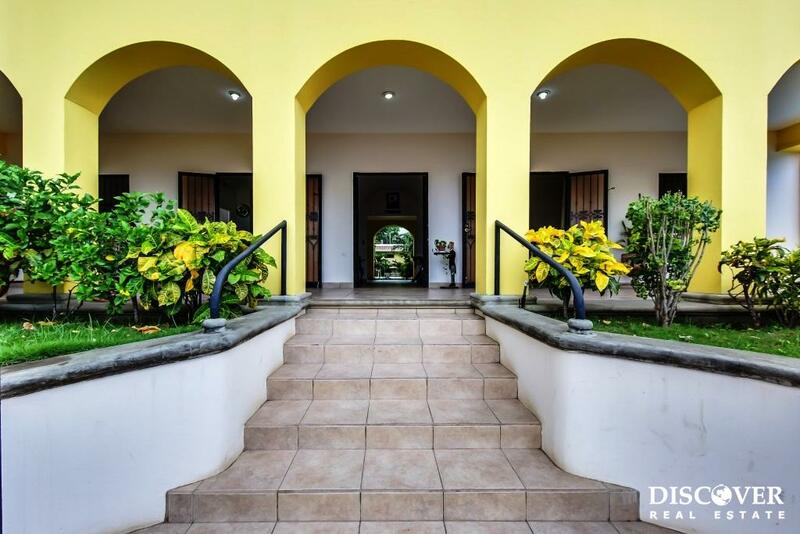 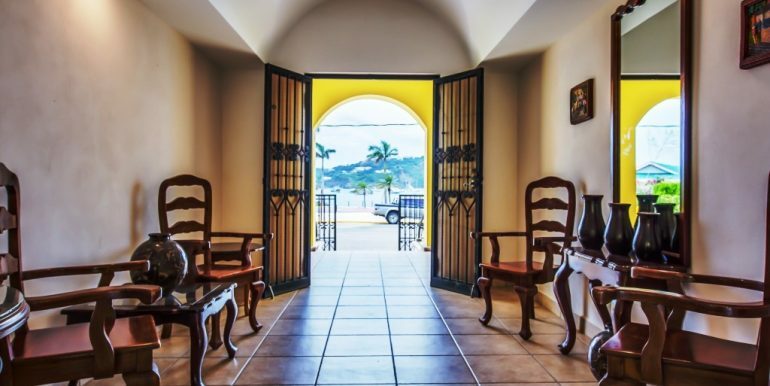 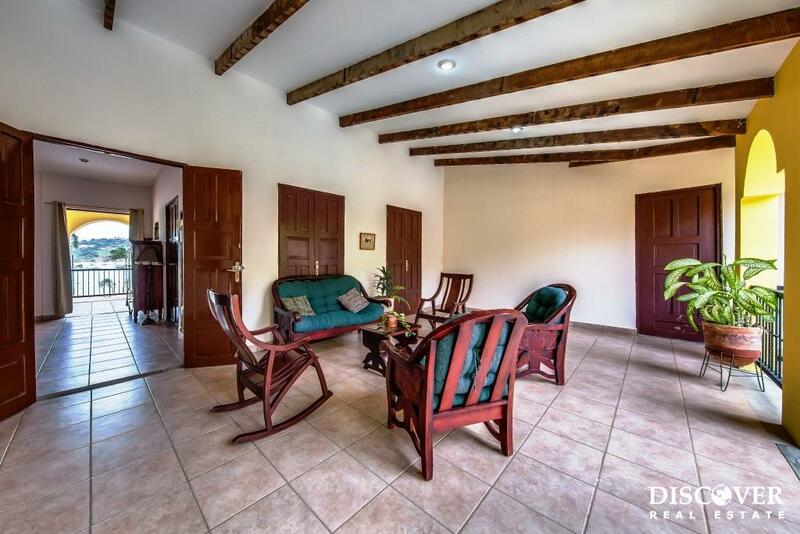 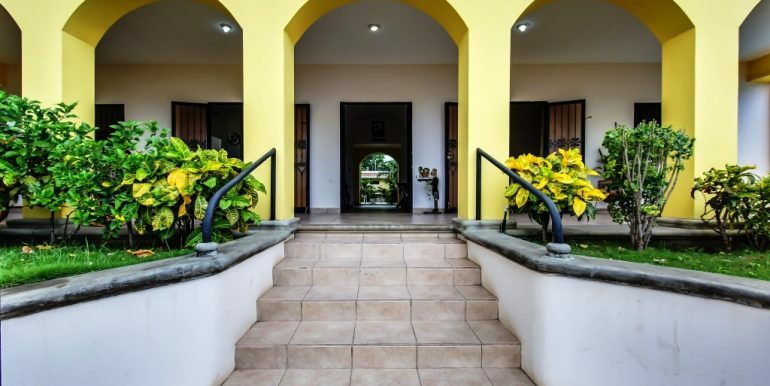 This is a rare opportunity to purchase Las Palmas, an elegant colonial style oceanfront house on the south side of the bay in San Juan del Sur, Nicaragua! 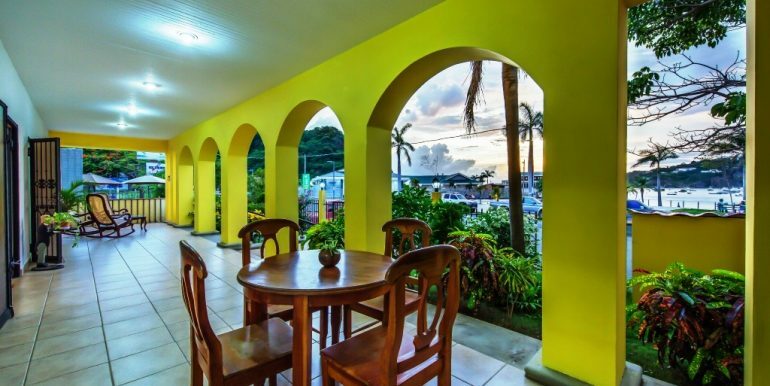 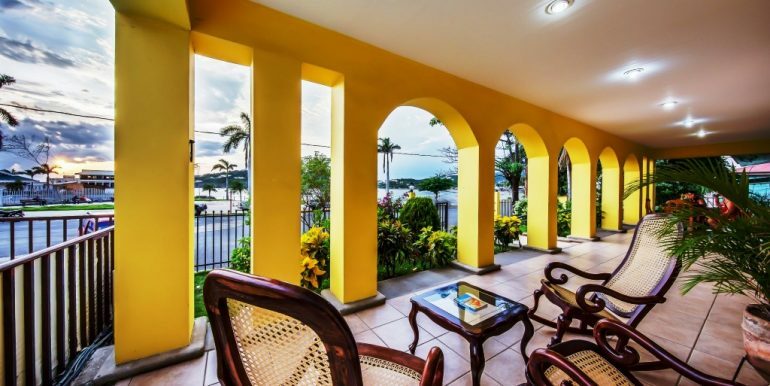 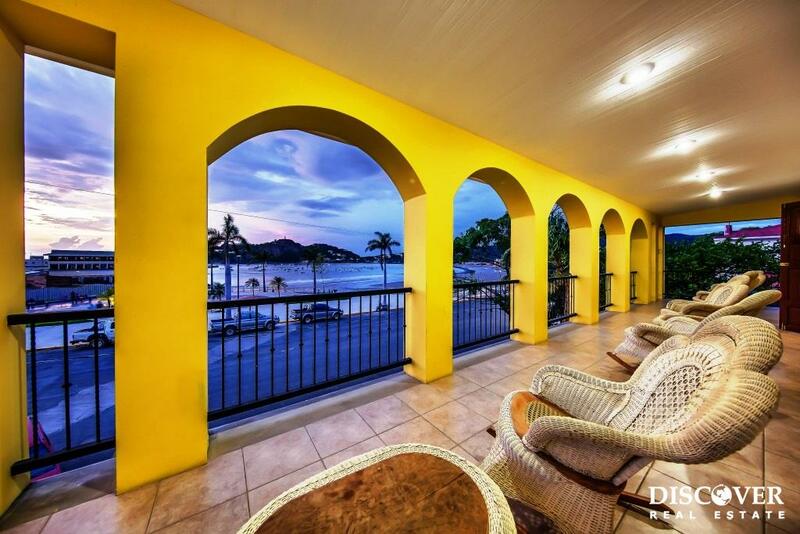 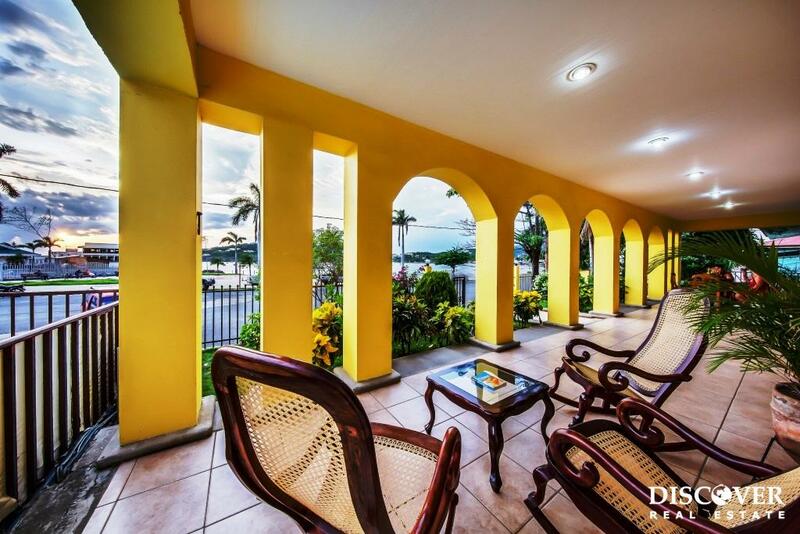 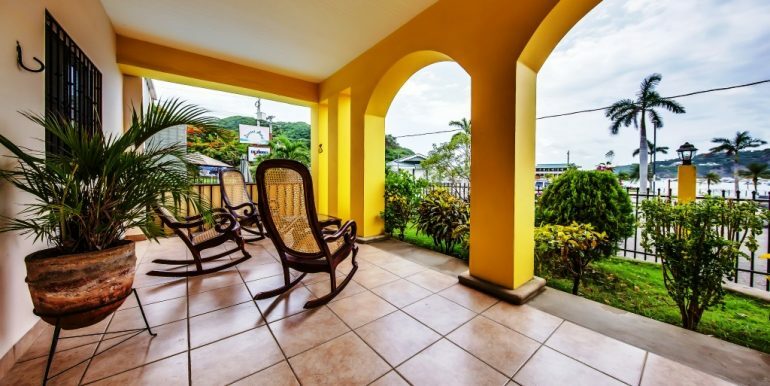 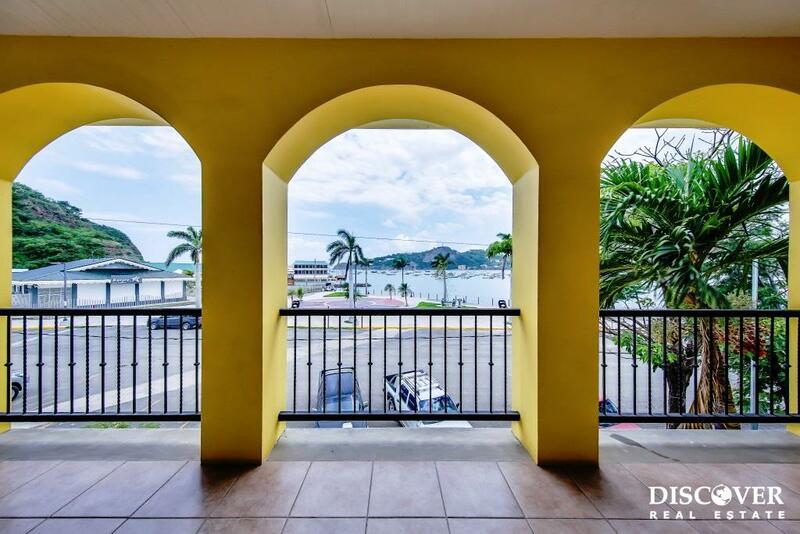 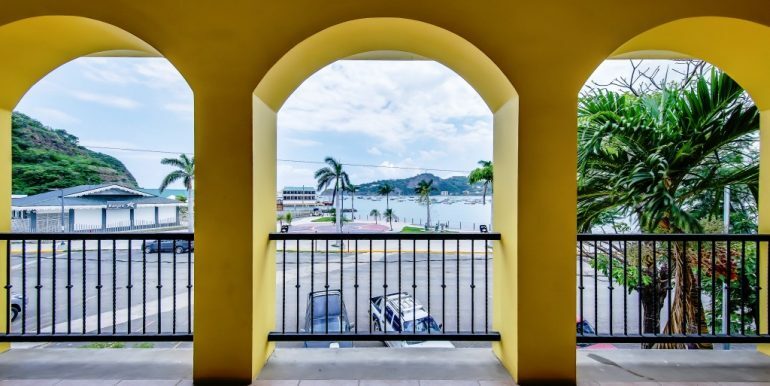 Extra wide ocean view terraces run the entire length of the building on the first and second floor giving you a grand view of the bay for sunsets, the north side of the city, and the twinkling lights in Pacific Marlin at night. 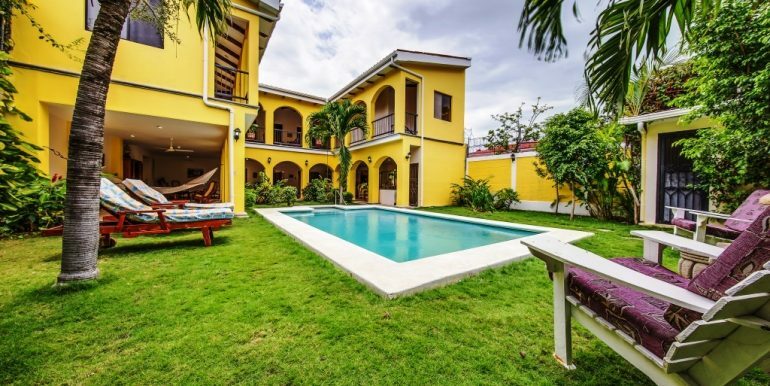 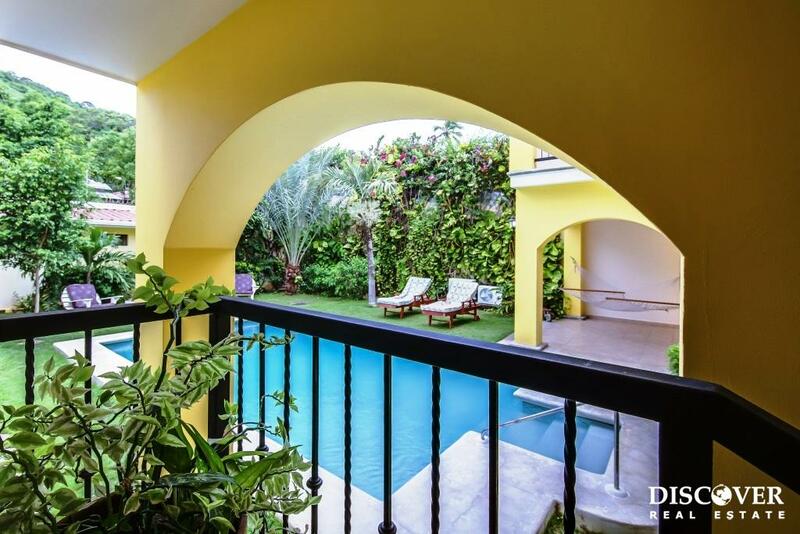 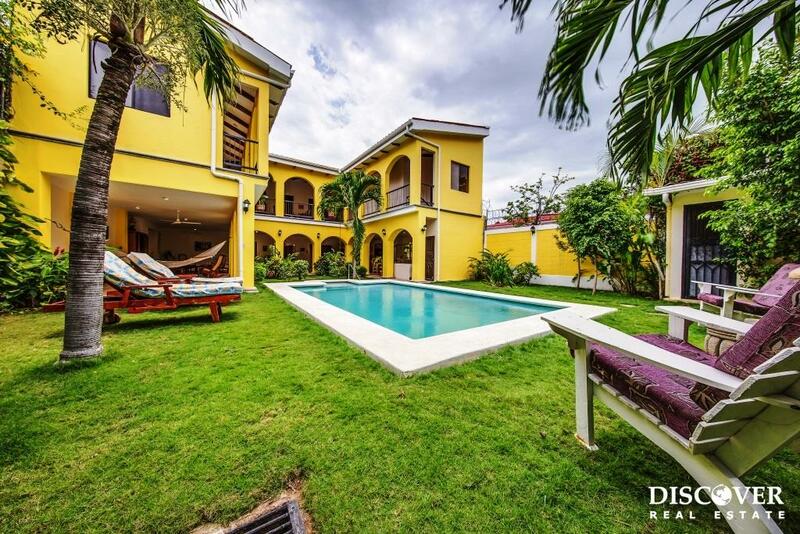 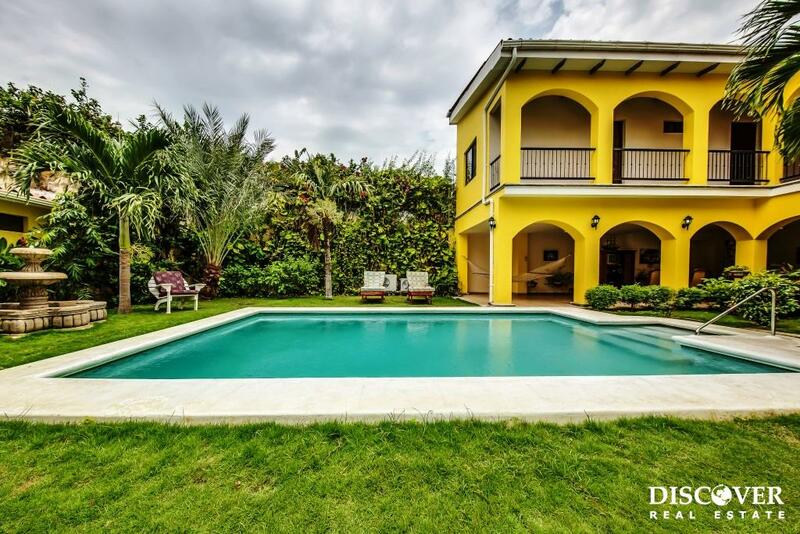 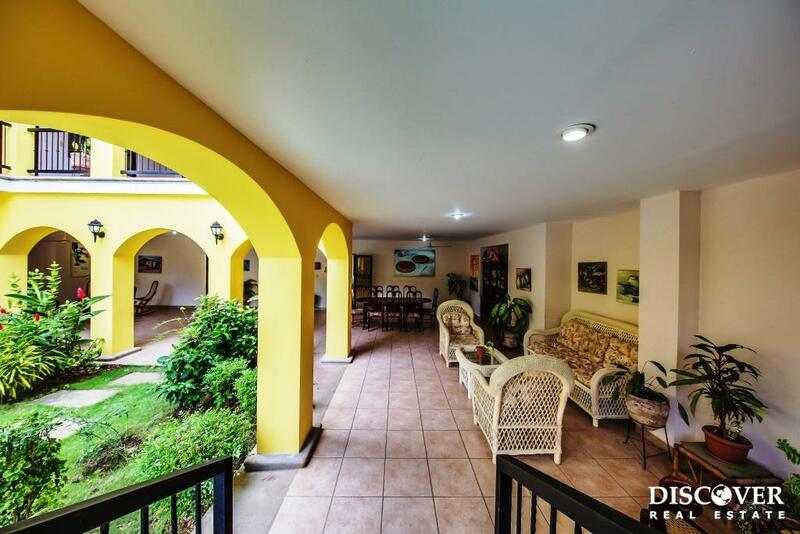 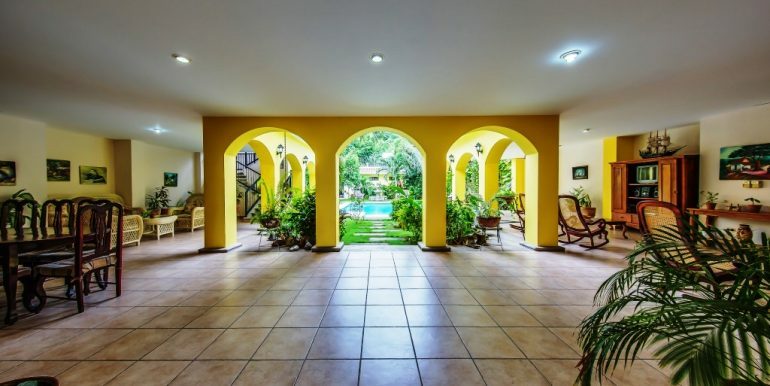 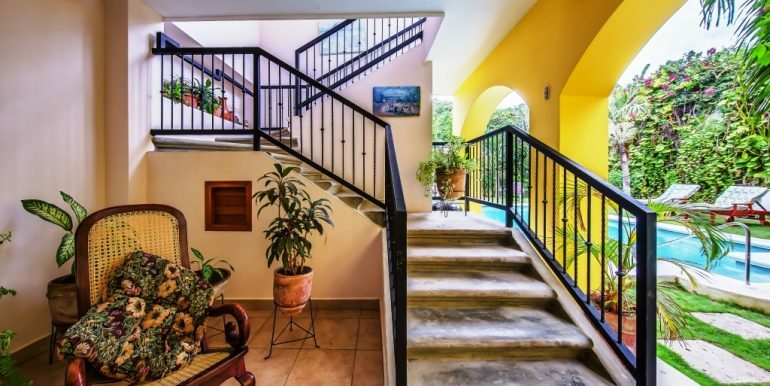 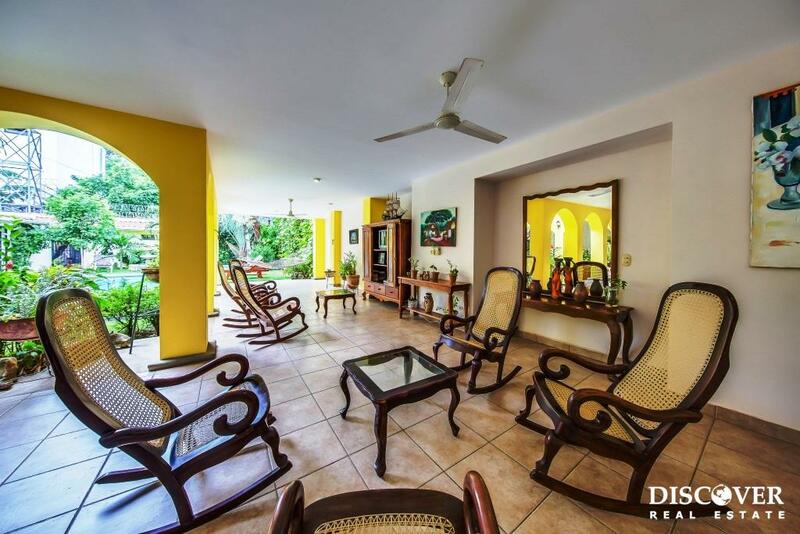 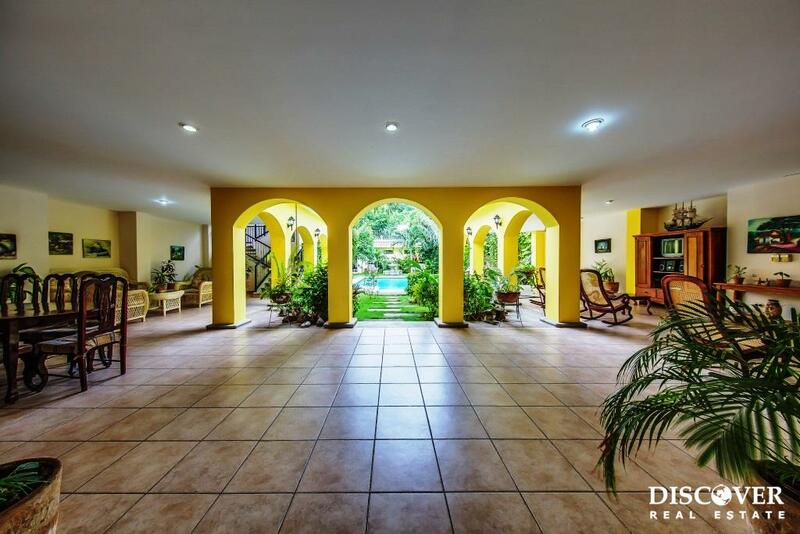 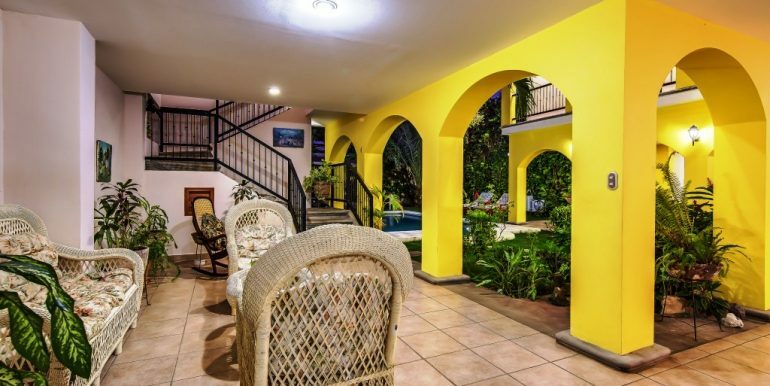 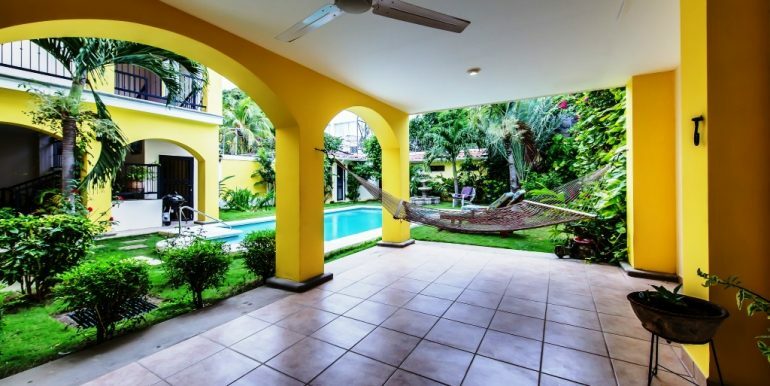 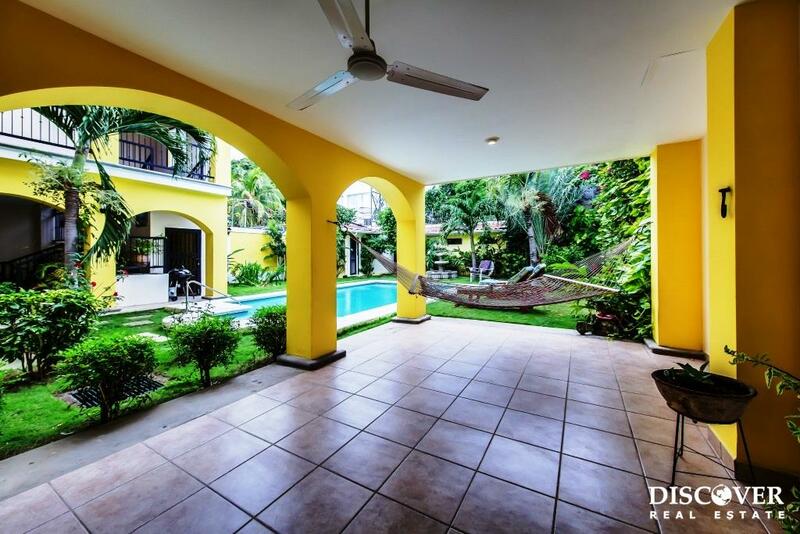 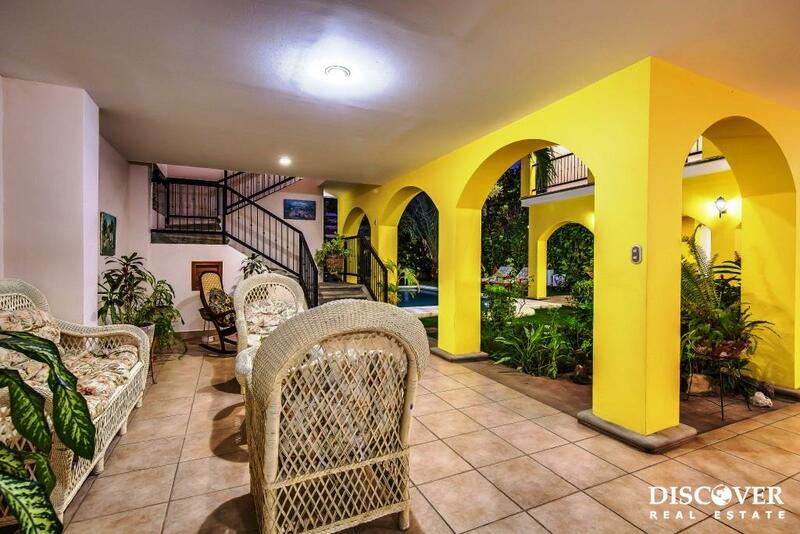 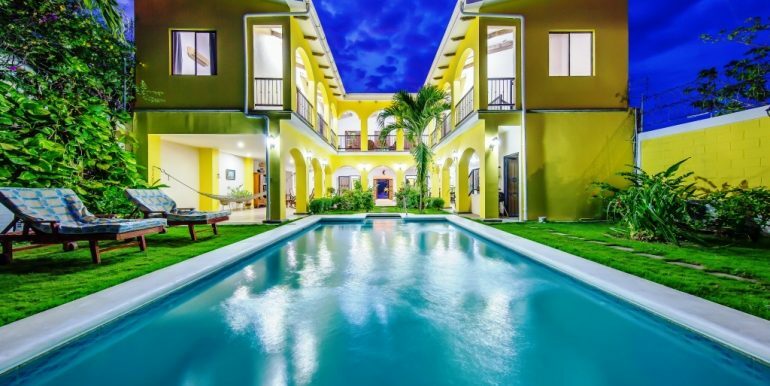 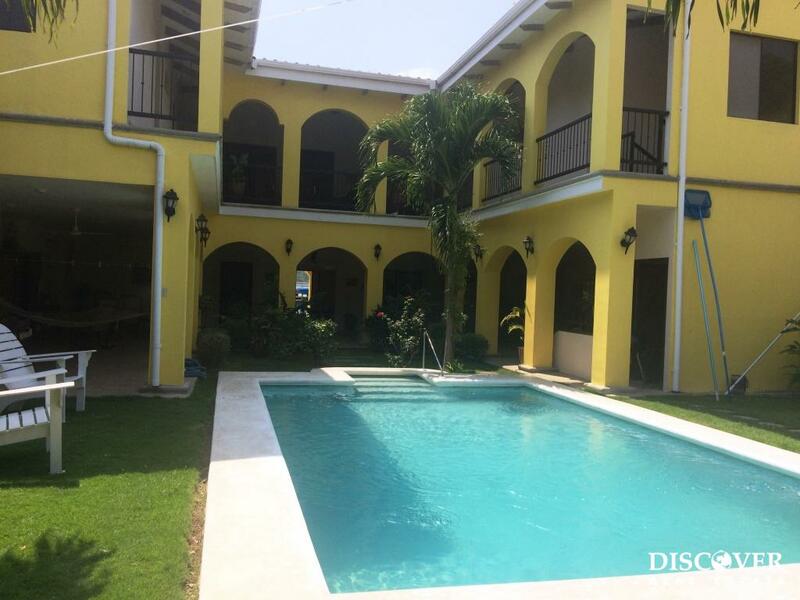 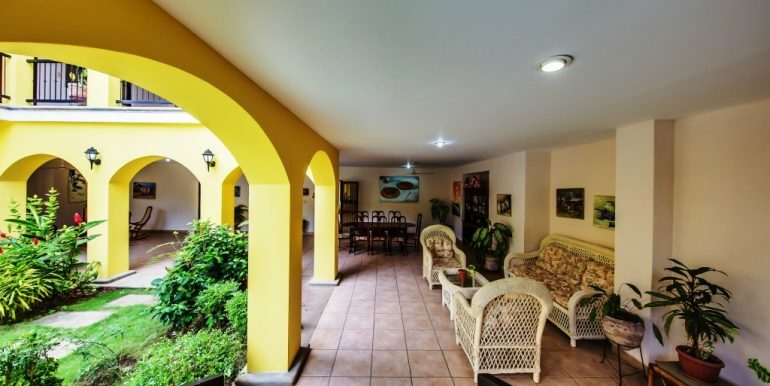 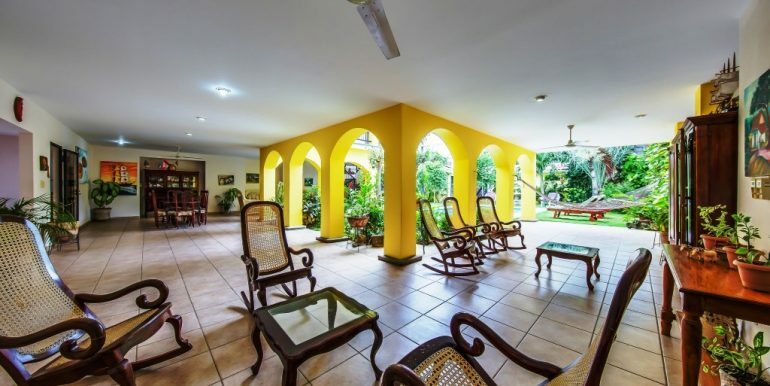 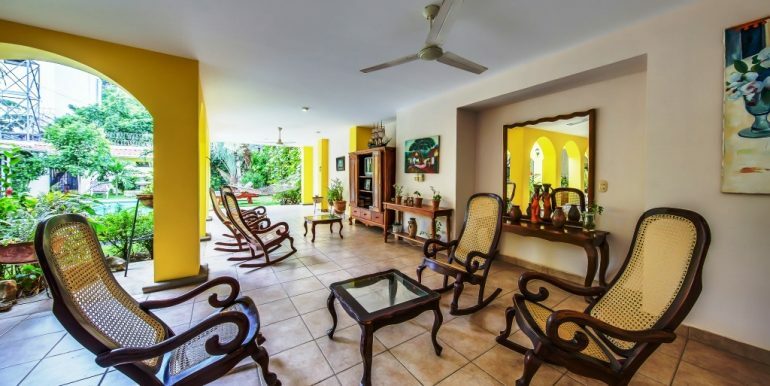 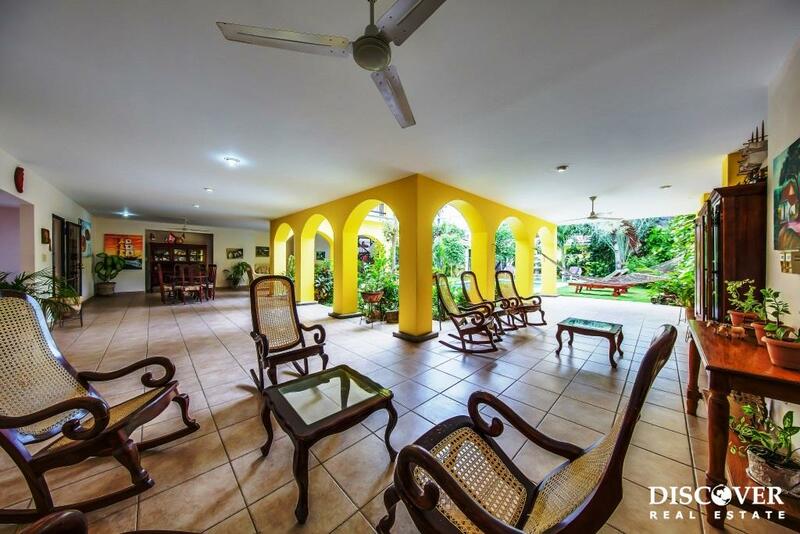 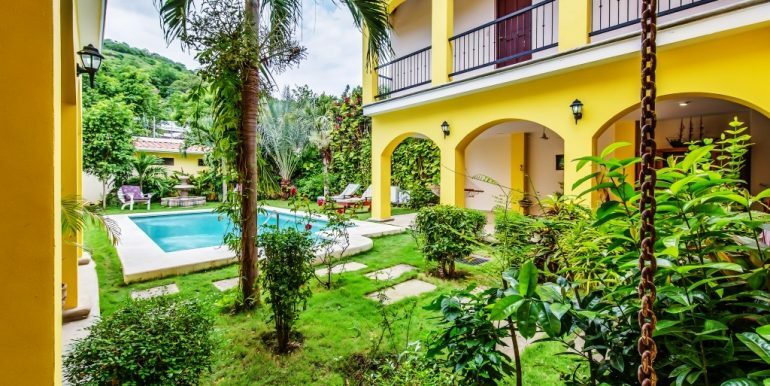 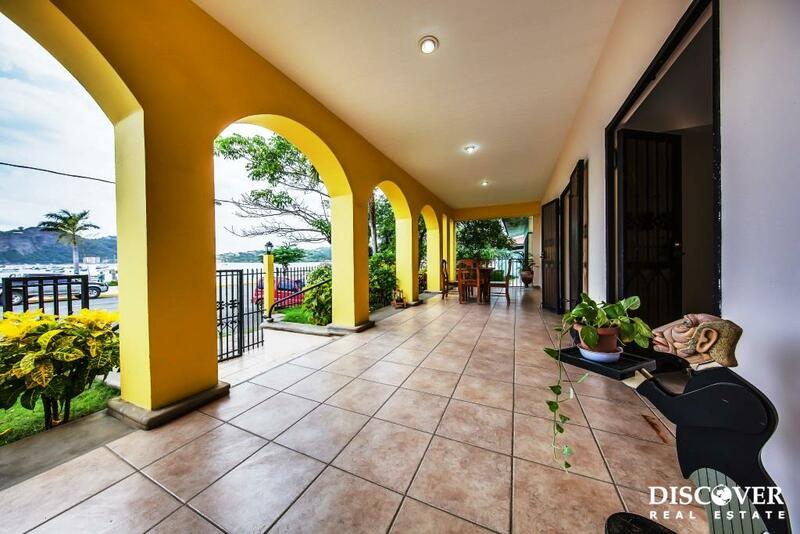 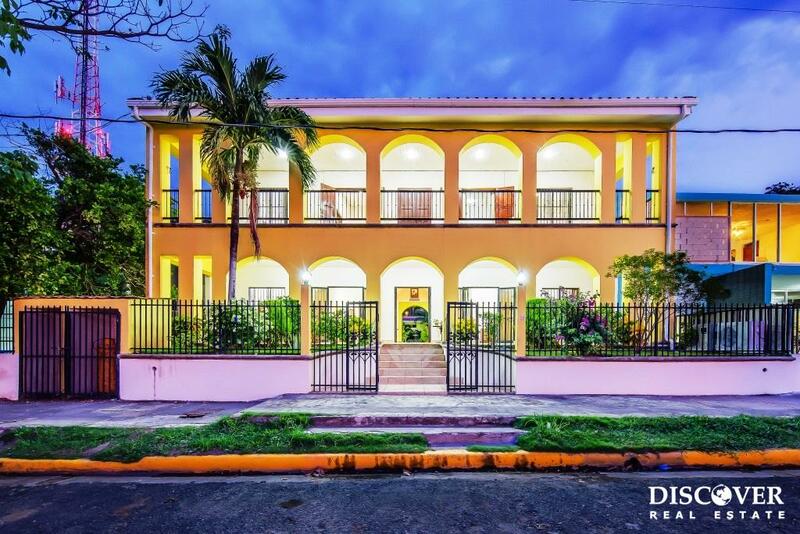 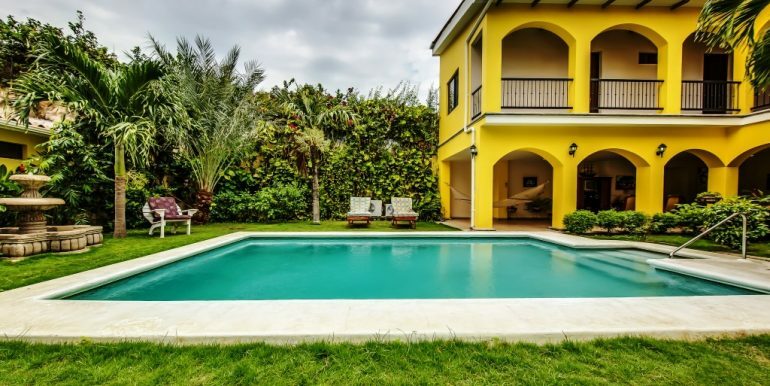 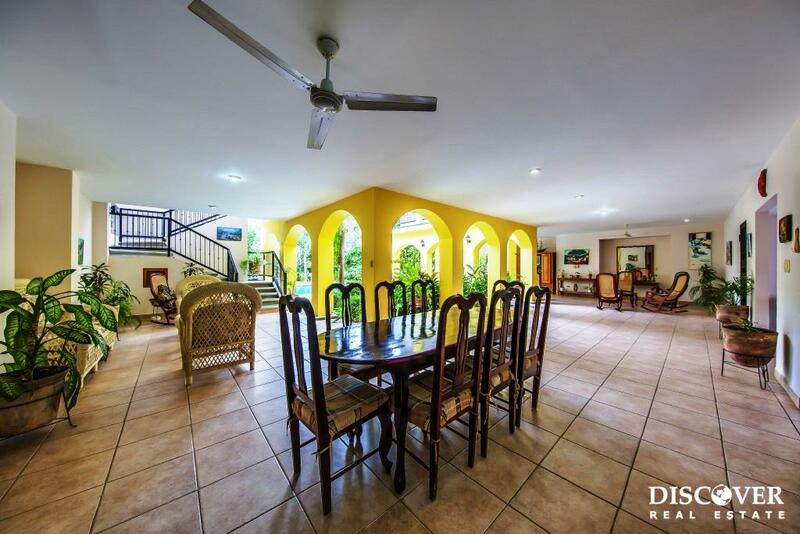 This Granada Style house has patios on both interior levels wrapping around a large central courtyard swimming pool. 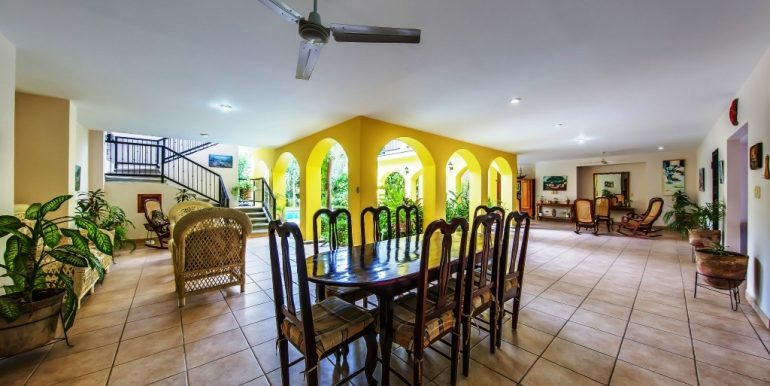 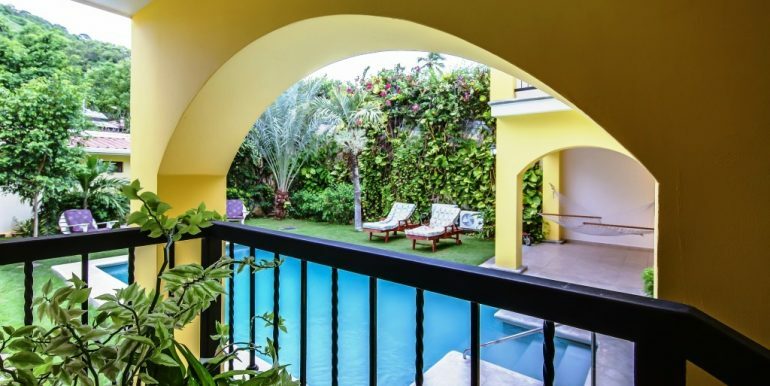 Extra tall french doors open onto the interior patios containing numerous dining, living, and social areas that look out to the courtyard swimming pool. 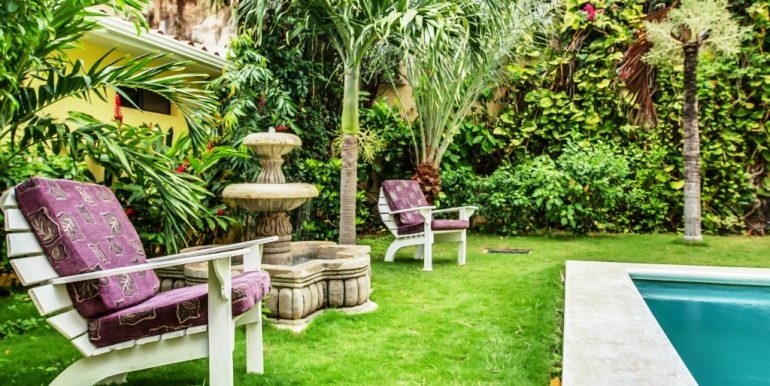 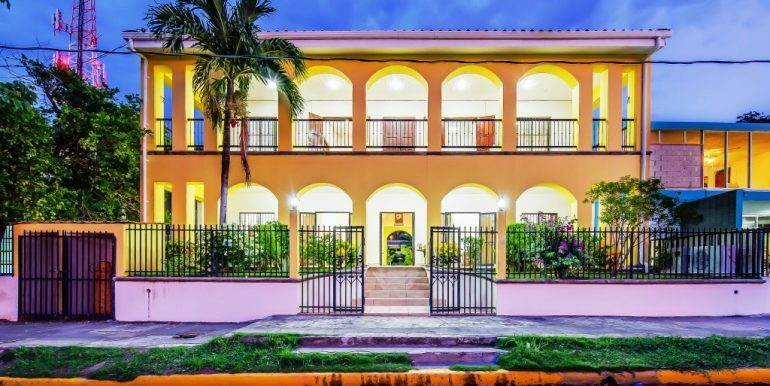 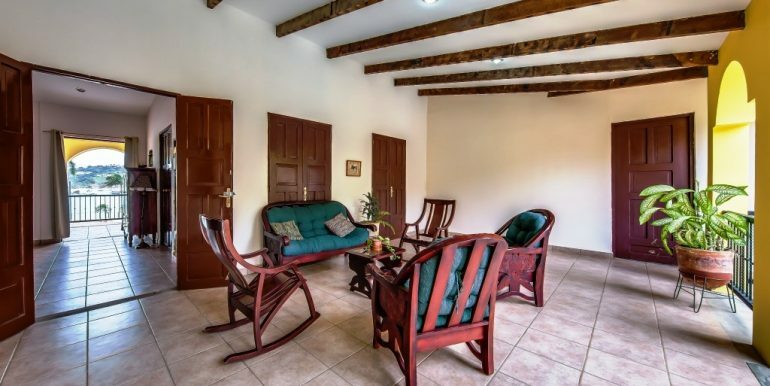 Enjoy the spaciousness of this elegant house with numerous private seating areas, turn it into a B&B, or convert it into a hotel by utilizing the extra space for expansion. 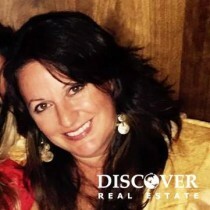 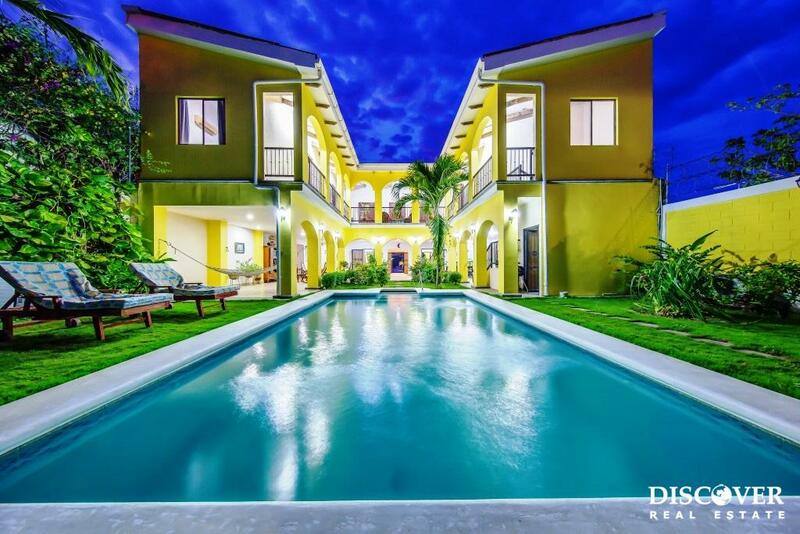 The owner will consider self-financing to qualified purchasers with 50% down and quarterly payments for 2 years at 5% interest. 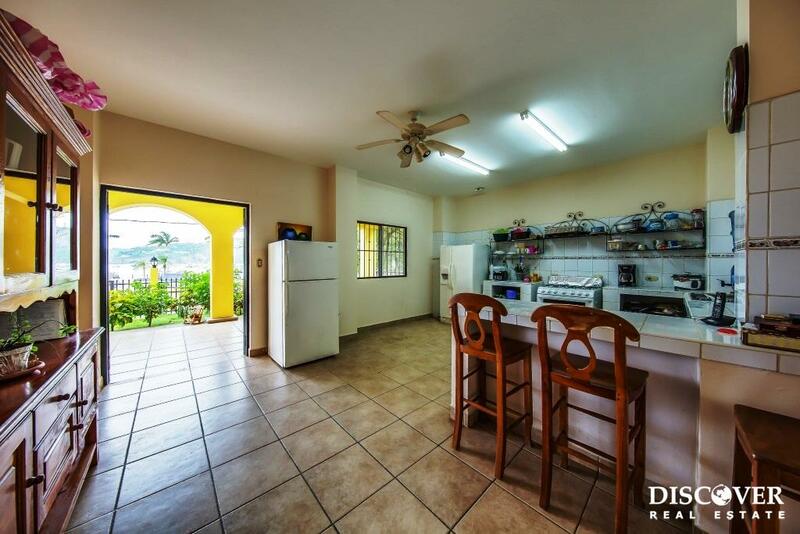 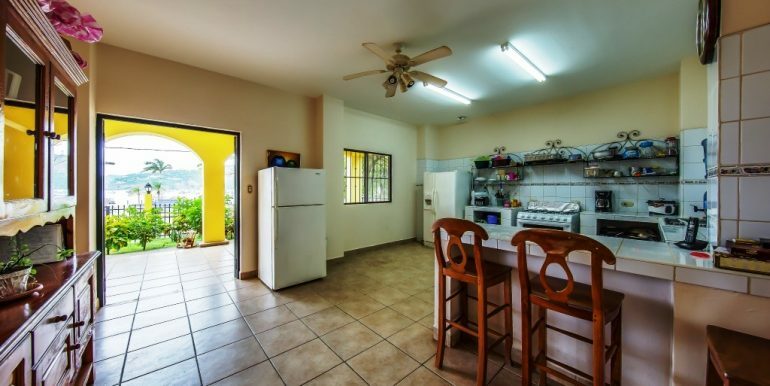 With an extra large kitchen and various social areas on the shady patios you can entertain or host guests in comfort. 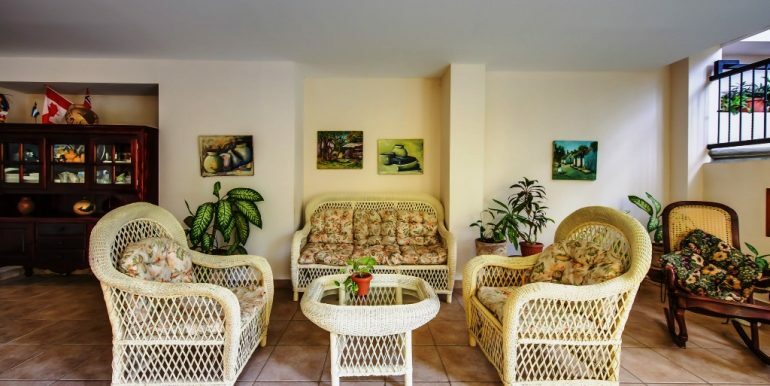 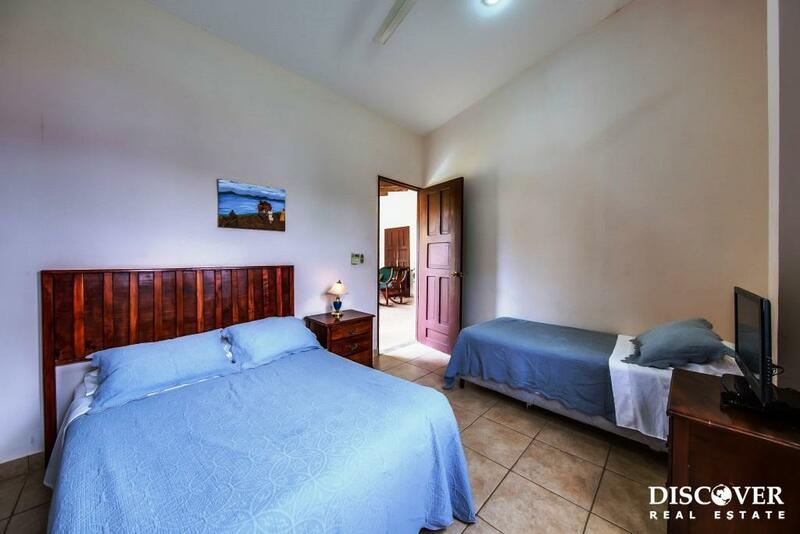 All 6 air conditioned bedrooms open onto terraces overlooking the courtyard swimming pool. 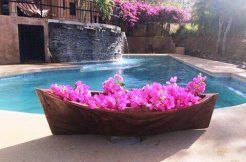 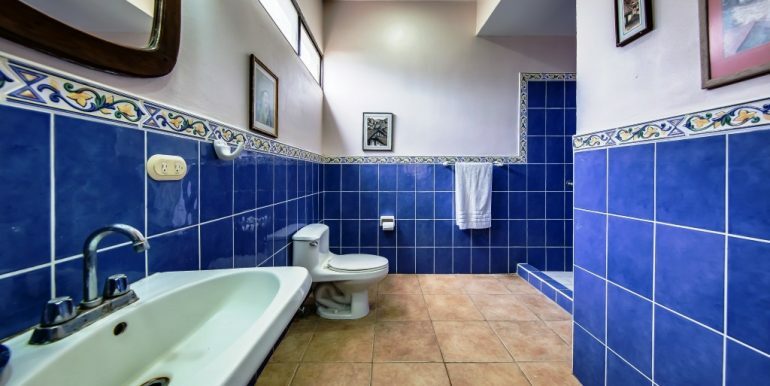 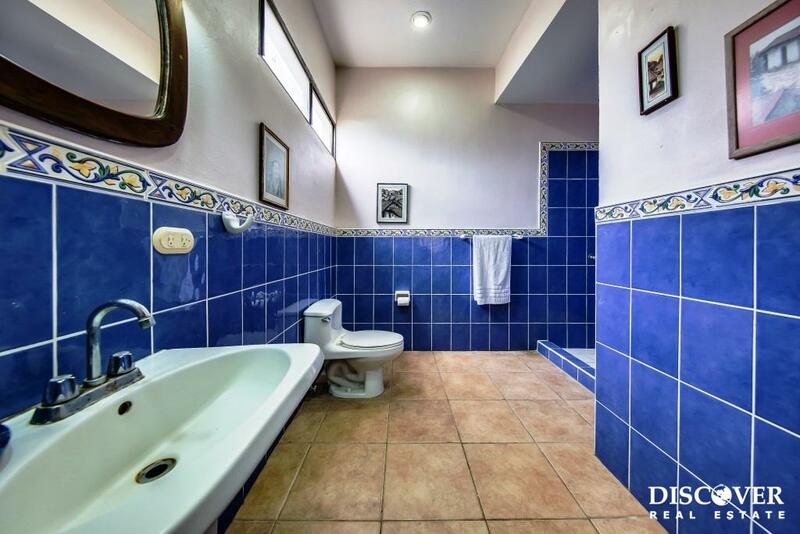 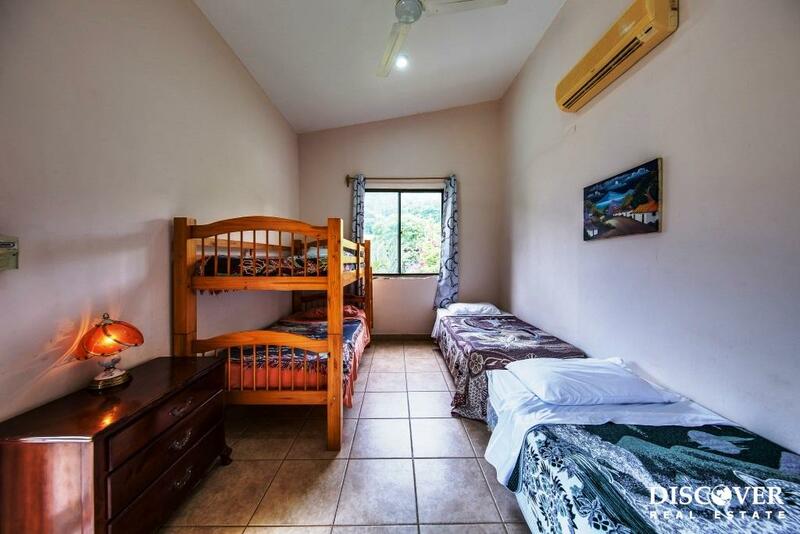 4 bedrooms have en-suite bathrooms and TVs, and two bedrooms share a bathroom plus there is a full bathroom off the pool area. 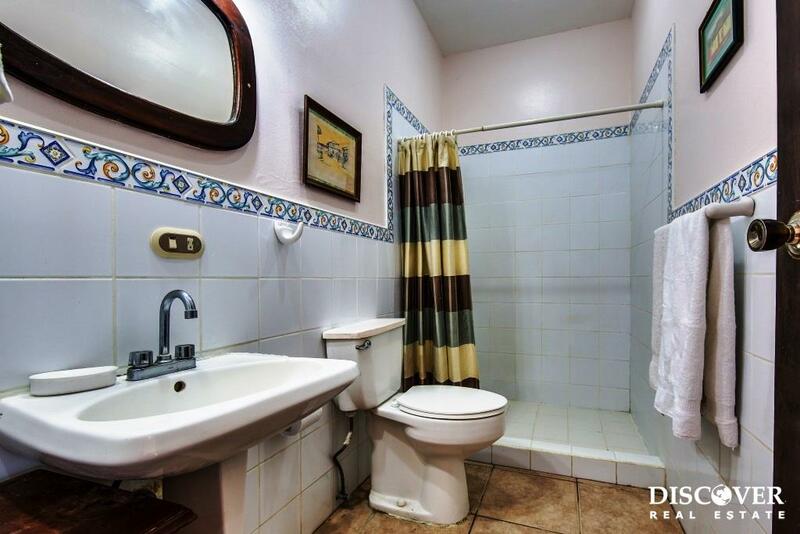 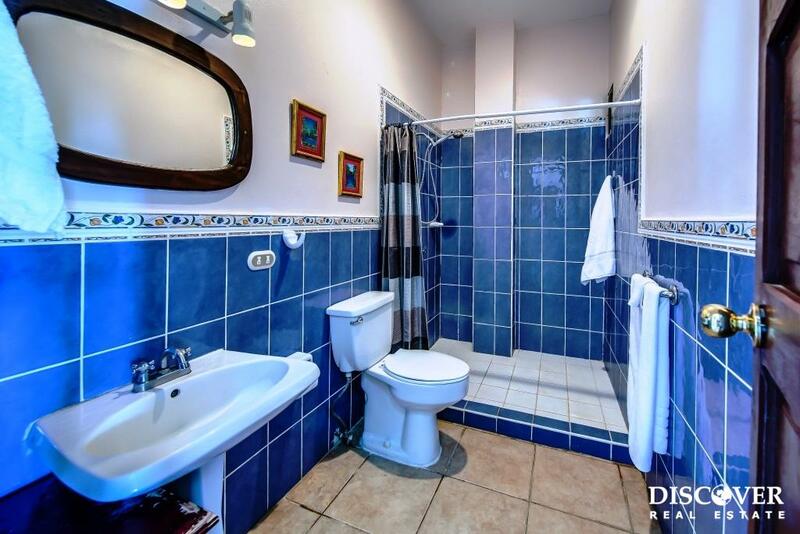 One bedroom is on the first floor with 5 on the second floor and they all have hot water in the showers and sinks. 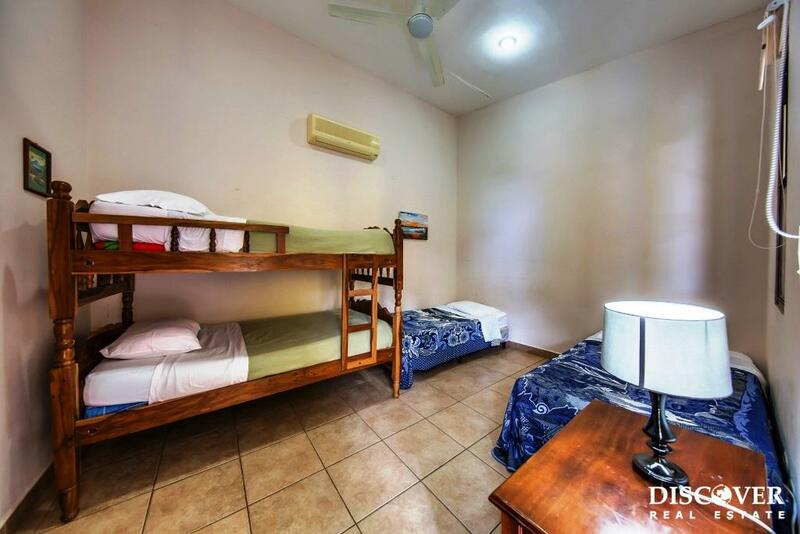 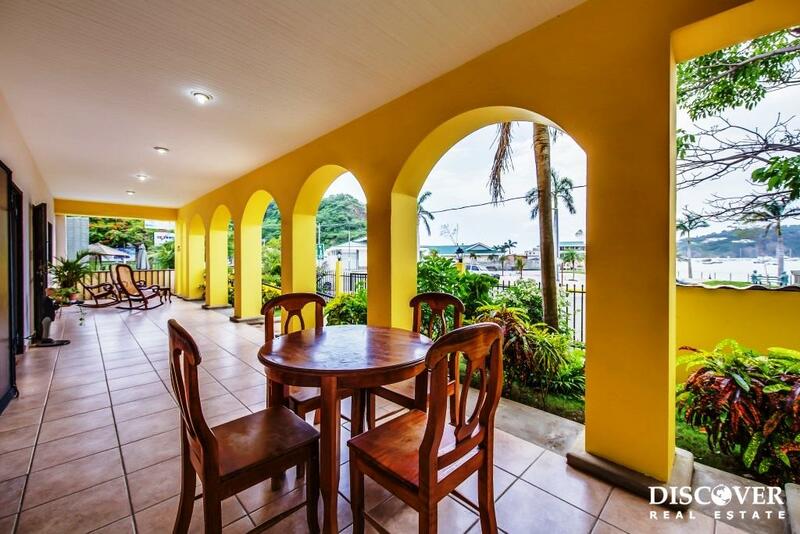 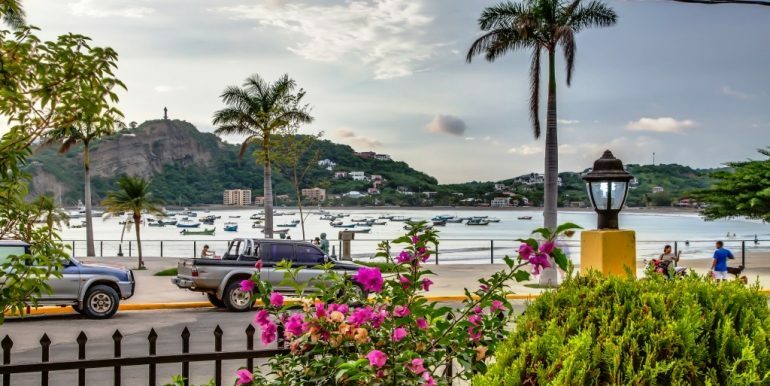 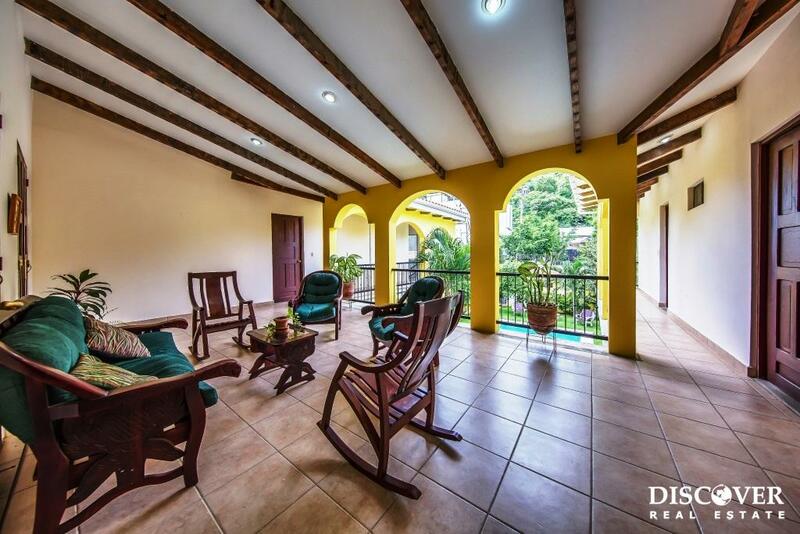 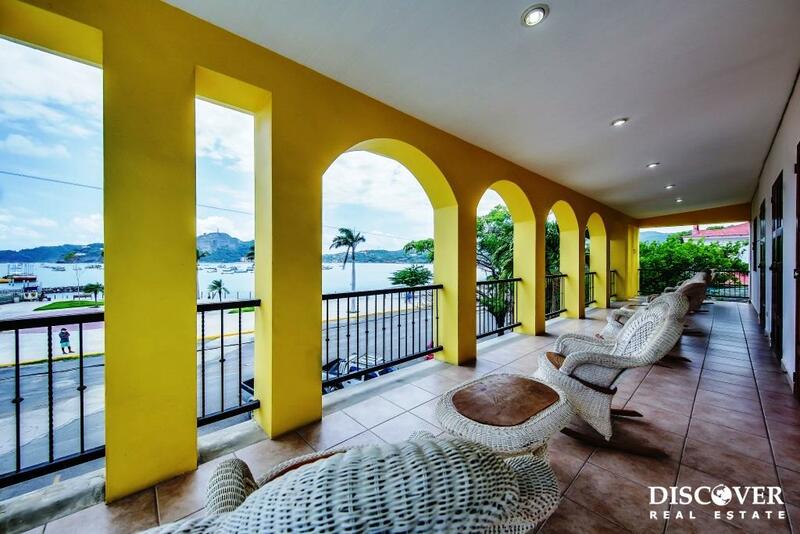 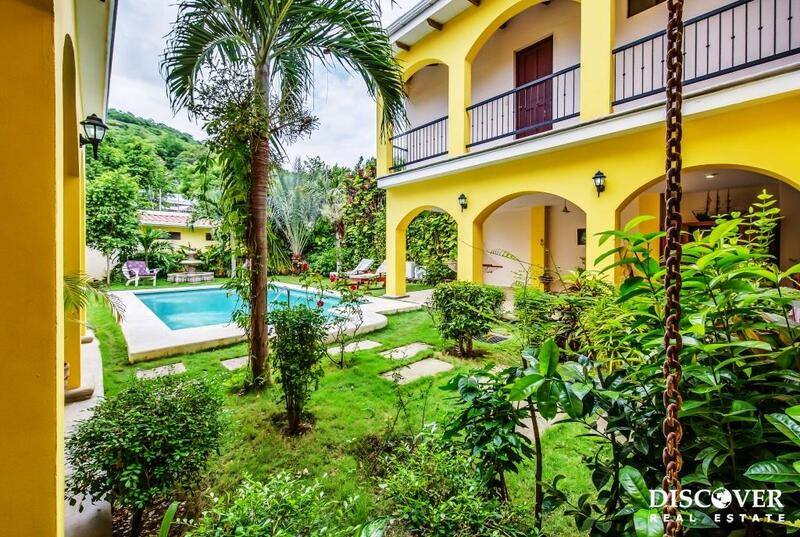 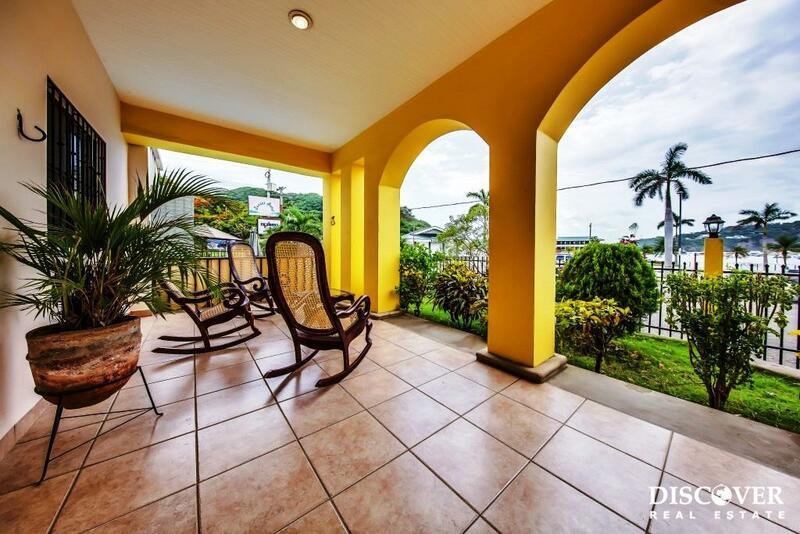 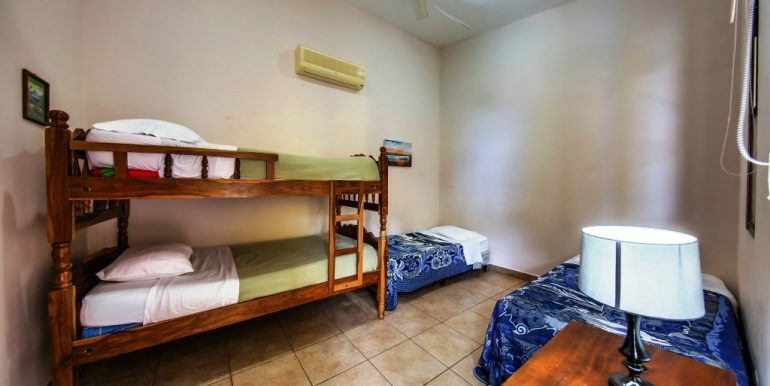 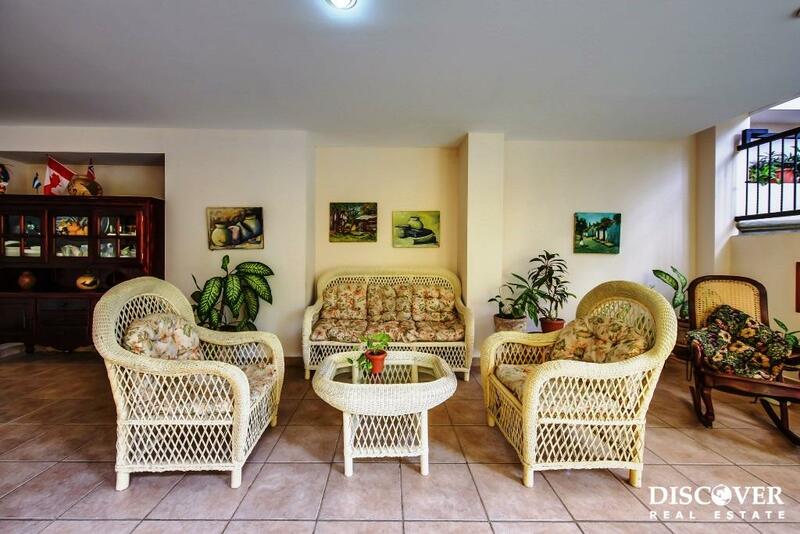 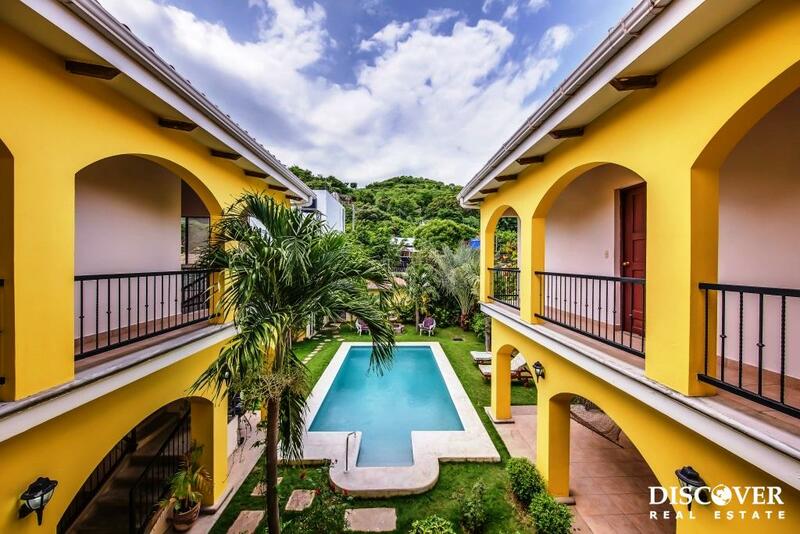 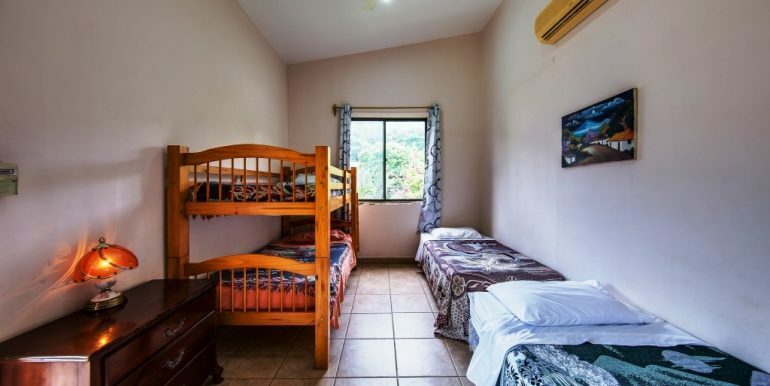 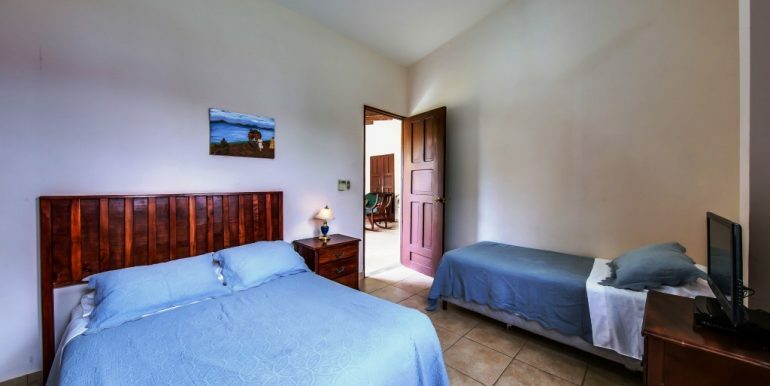 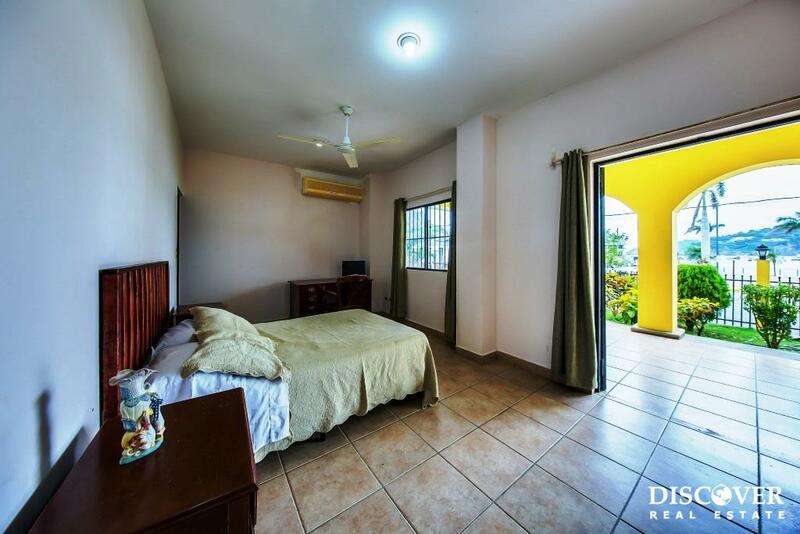 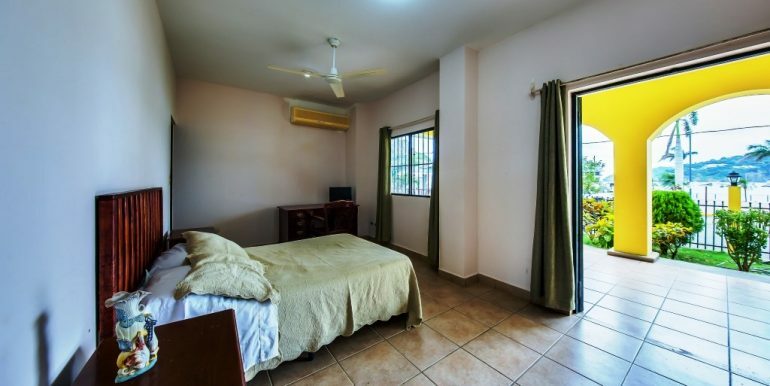 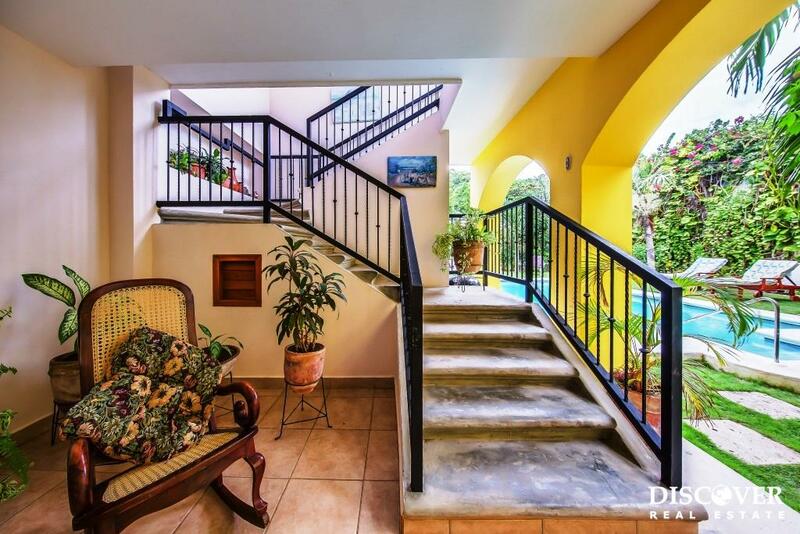 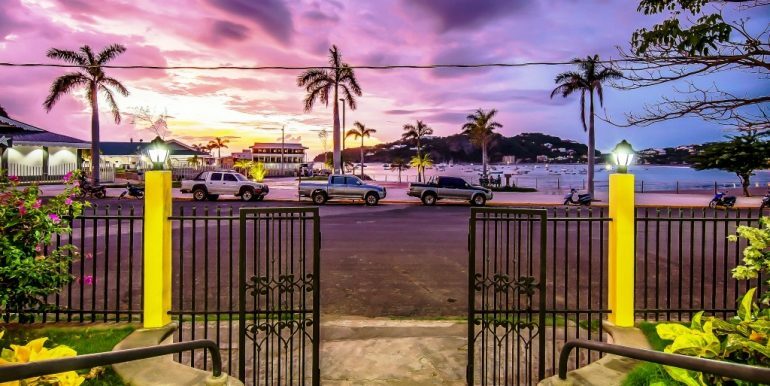 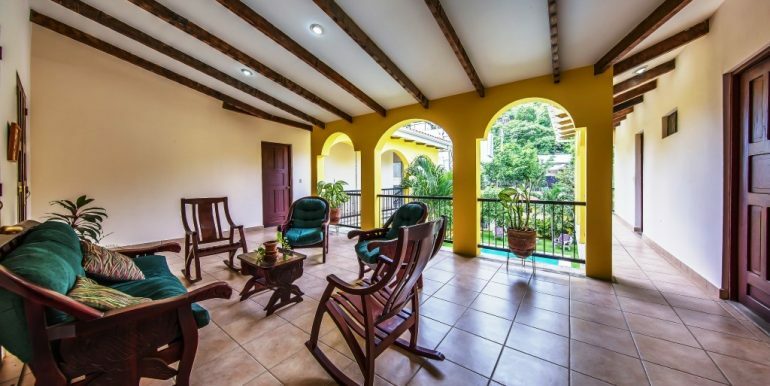 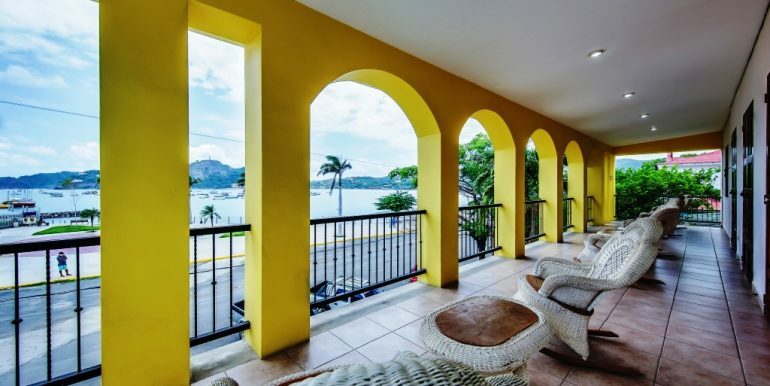 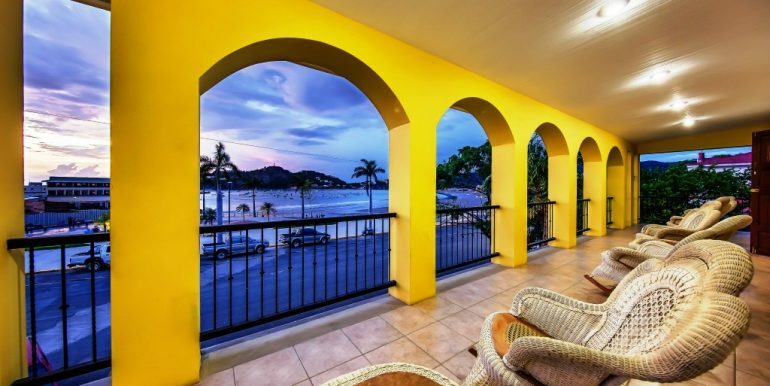 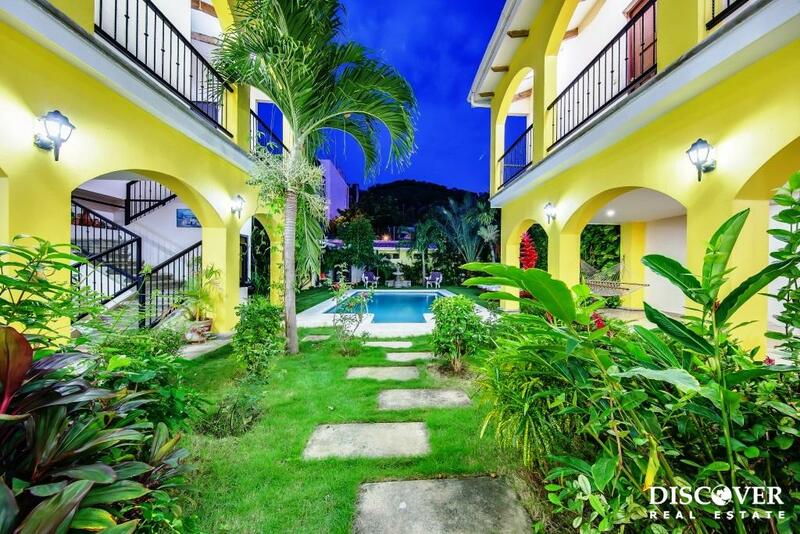 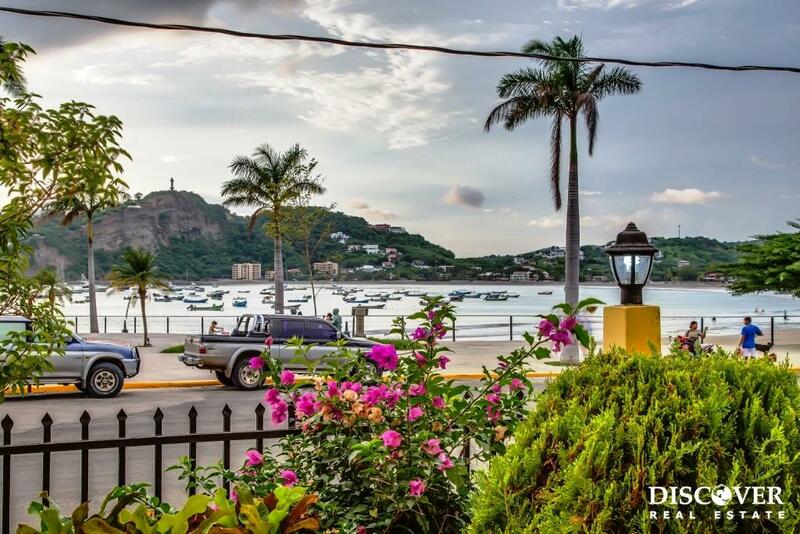 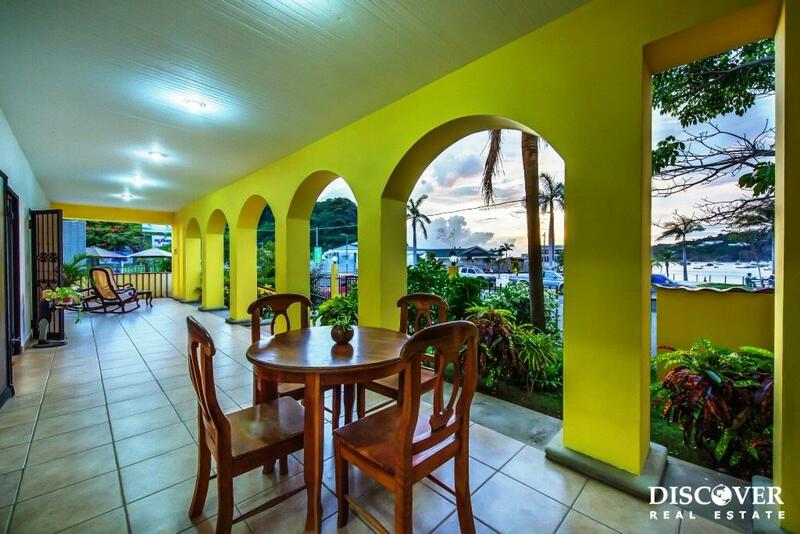 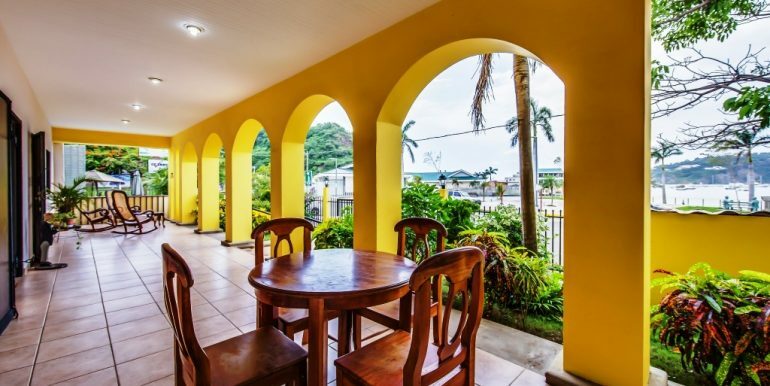 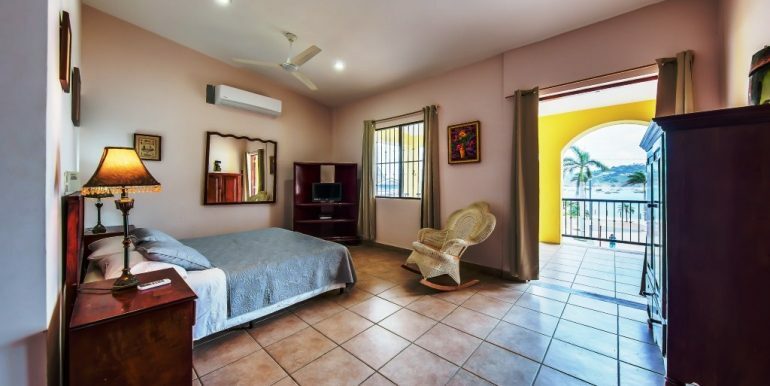 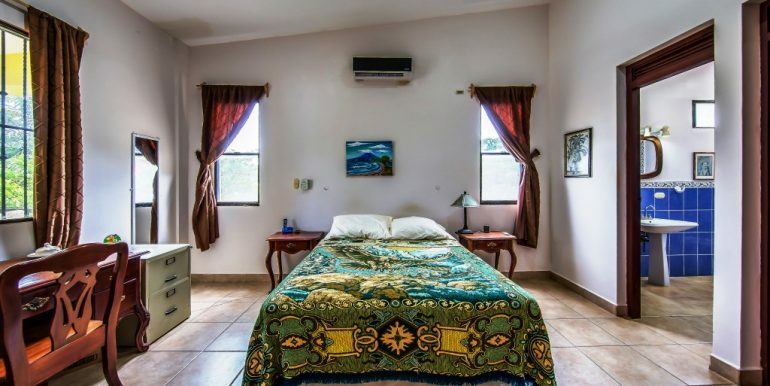 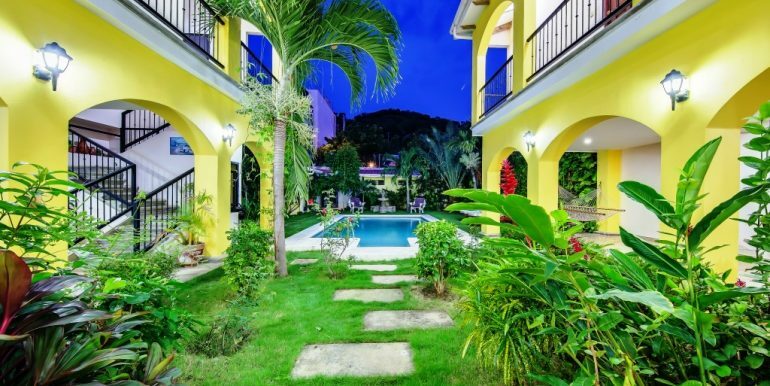 Conveniently located in town with all the restaurants, shops, and amenities of San Juan del Sur within easy walking distance. 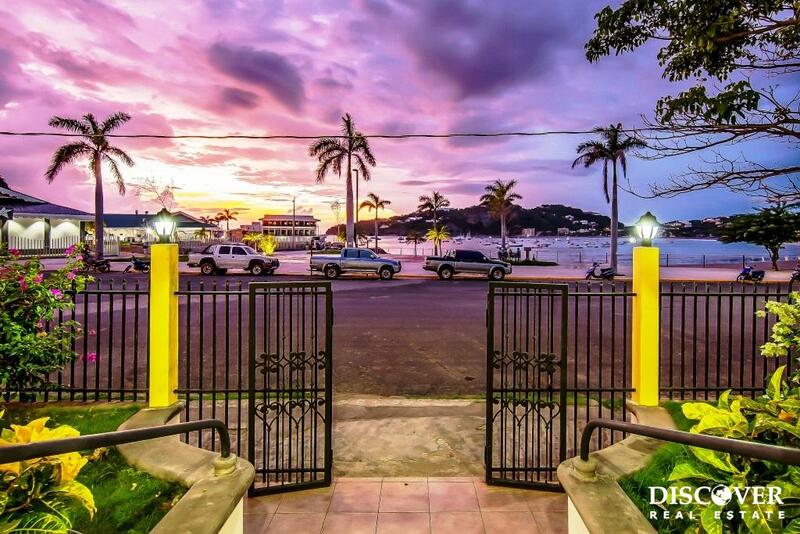 Parking is always available on the street in front of the house or in the back gated parking area. 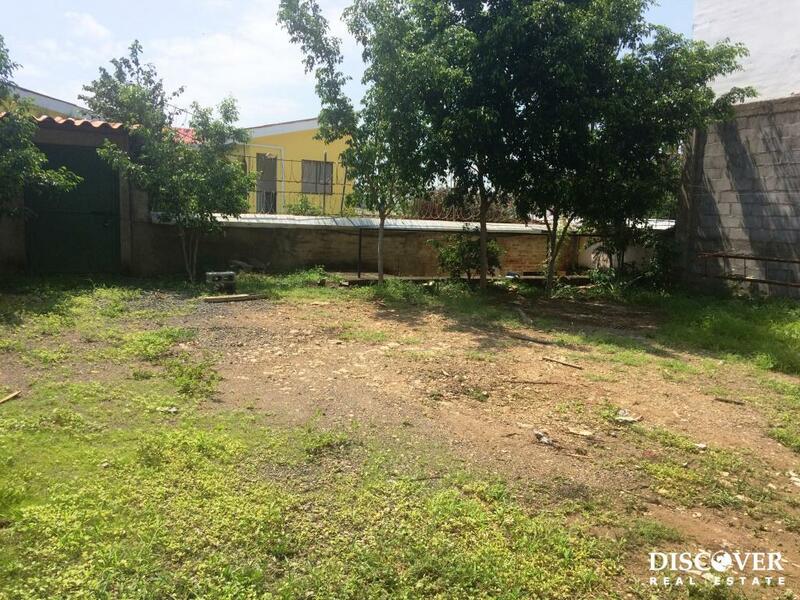 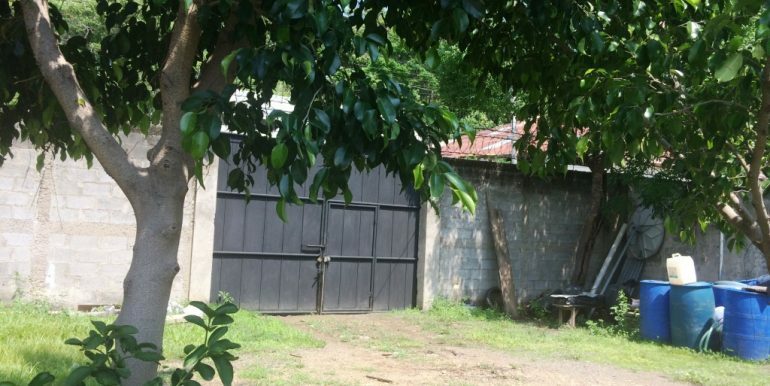 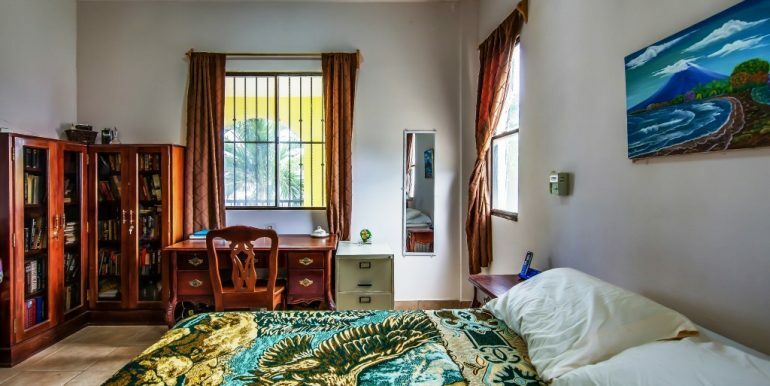 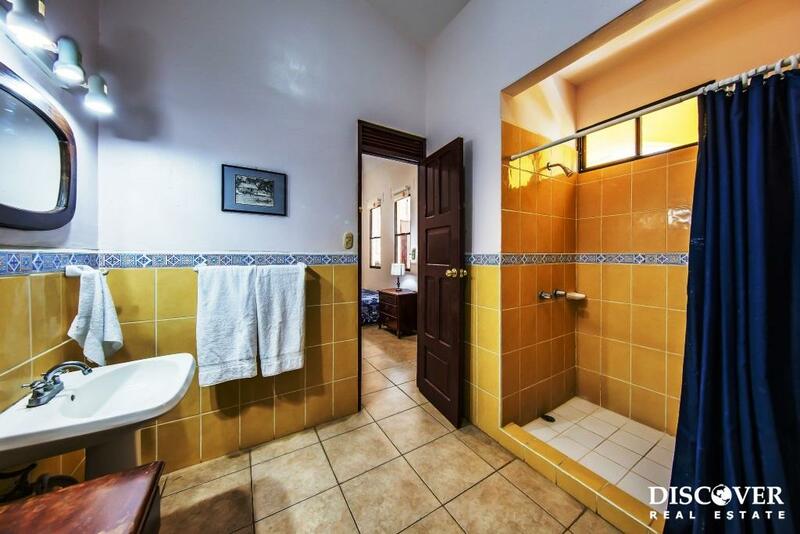 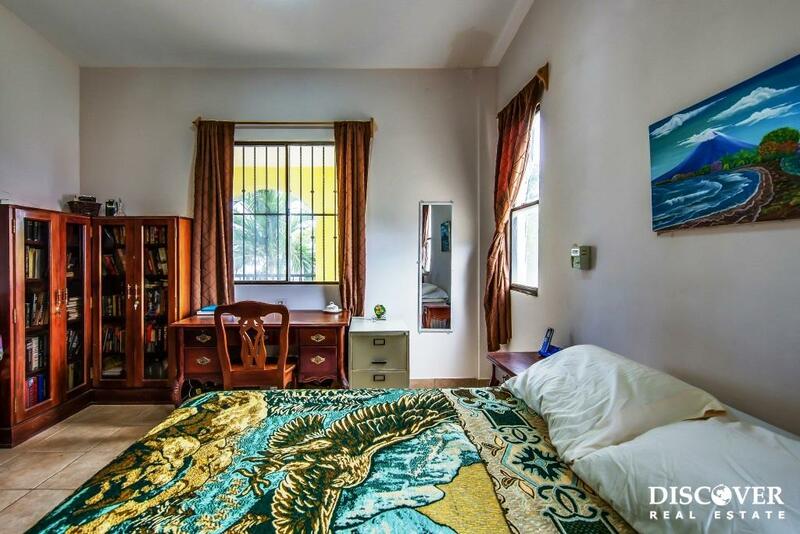 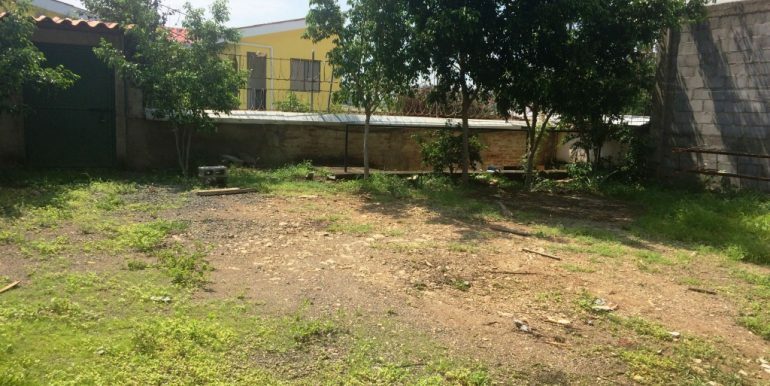 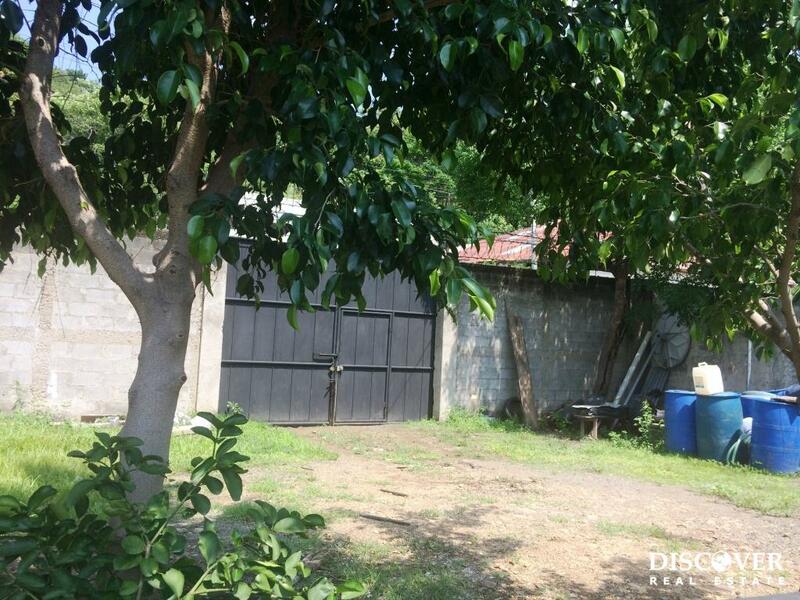 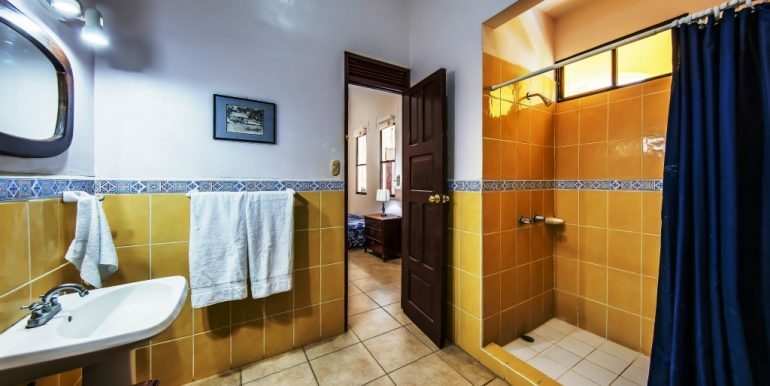 The property stretches street to street and located at the back of the property is a laundry room, caretaker’s residence, elevated water tank, and enough gated off street parking for at least 6 vehicles. 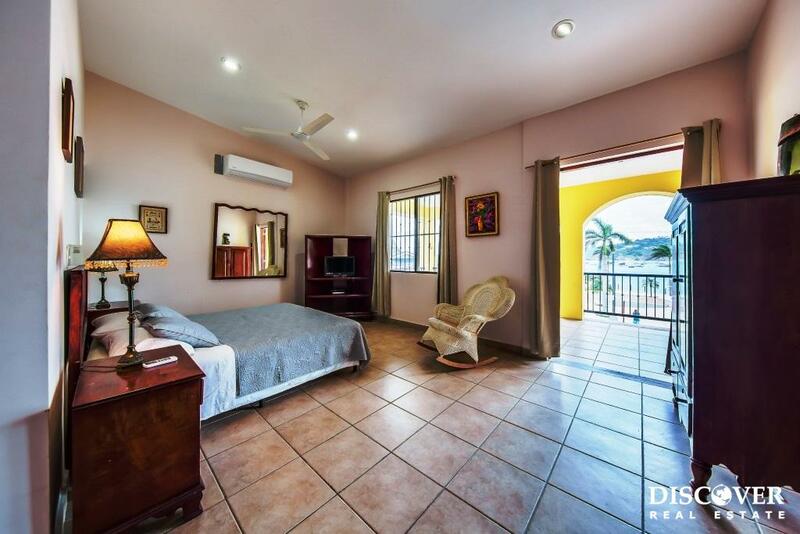 The property can easily be expanded by building two more levels of ocean view rooms above the parking area and caretaker’s residence. 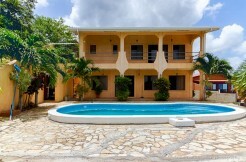 The main house, built in 2001, was designed to hold another 2 floors of construction if you wish to add even more rooms. 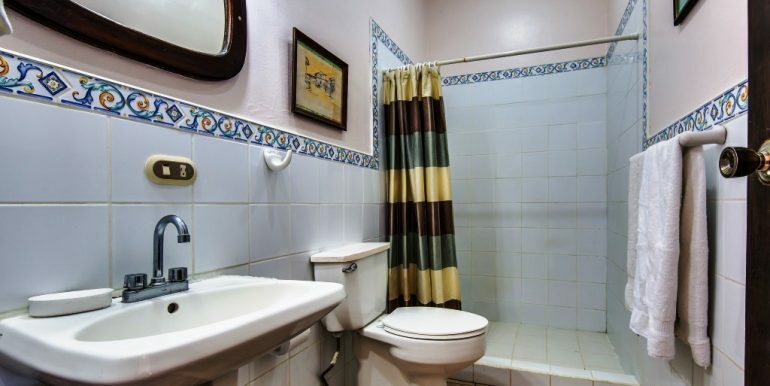 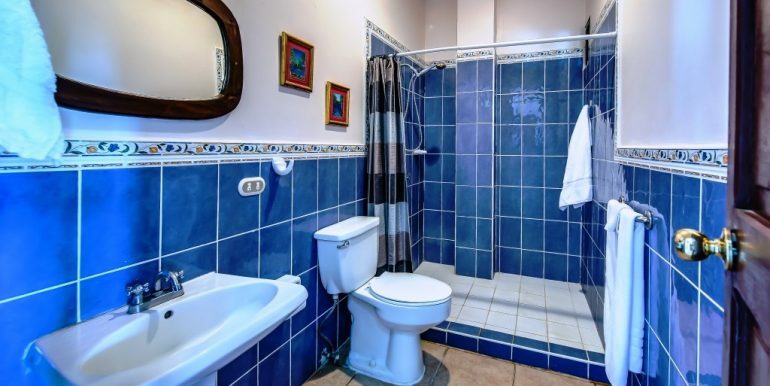 This occasional rental property generates an income, after all expenses, of $35,000 a year even with the owner occupying one of the upstairs bedrooms and upstairs living room most of the year. 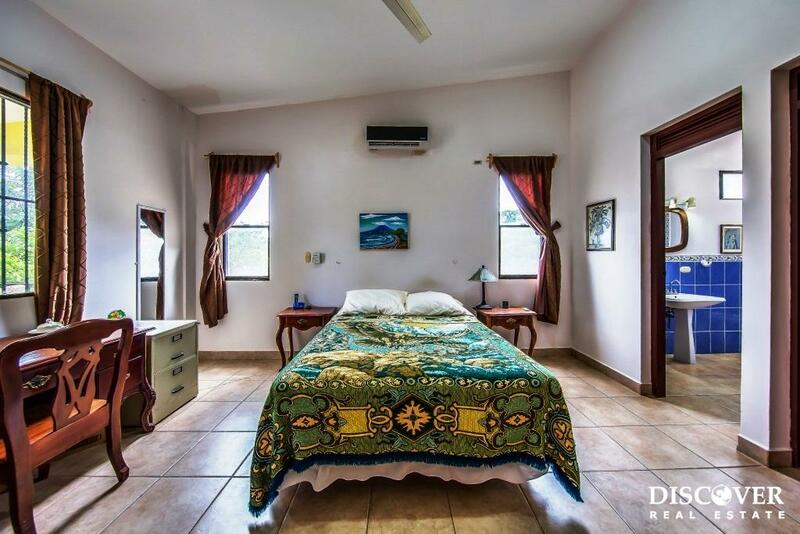 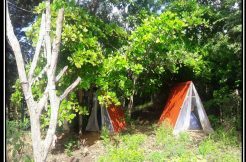 Amazing business opportunity to either use an established yoga retreat center or turn it into an Airbnb Jungle Campground!